Warning: This post is going to be DOOZY. But bear with me, it’s a good one. 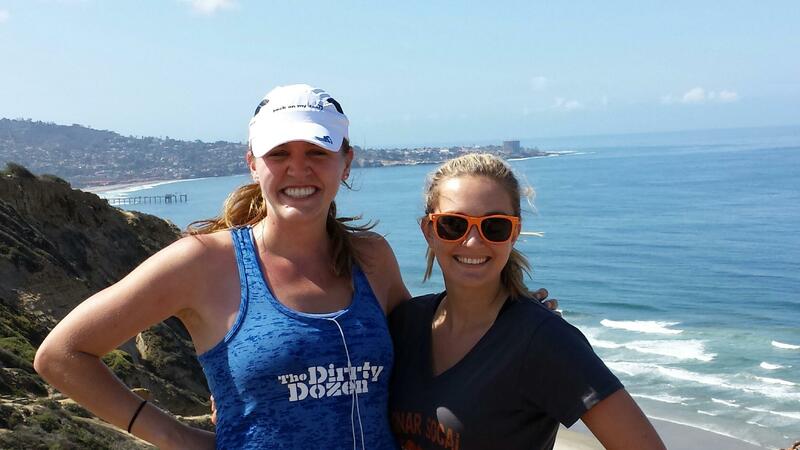 This last weekend, I had the privilege to race Ragnar SoCal with Team Dirrty Dozen. 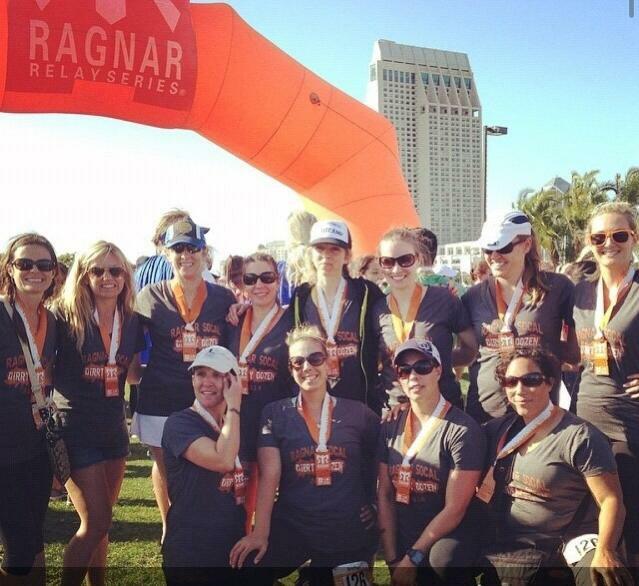 I had always wanted to do a Ragnar, but was put off by the insane amount of organization that would be required. 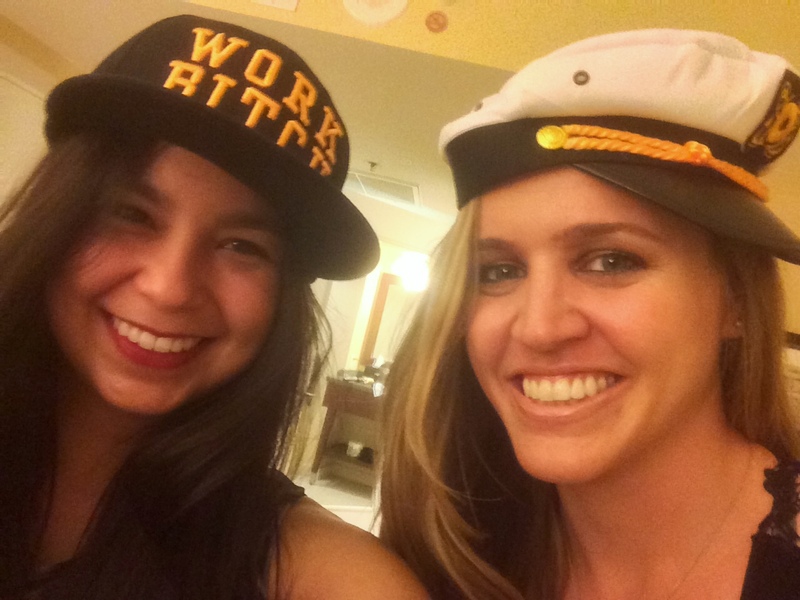 Luckily, my friend Melissa contacted me a few months ago about filling a spot on a team of women who met at FitBloggin’ and I jumped at the chance. We all met up on Thursday night for a team dinner at the Old Spaghetti Factory. I drove home to DTLA, and set my alarm for 4:10 am to meet up with the team the next morning. It was an early morning, but I was excited! 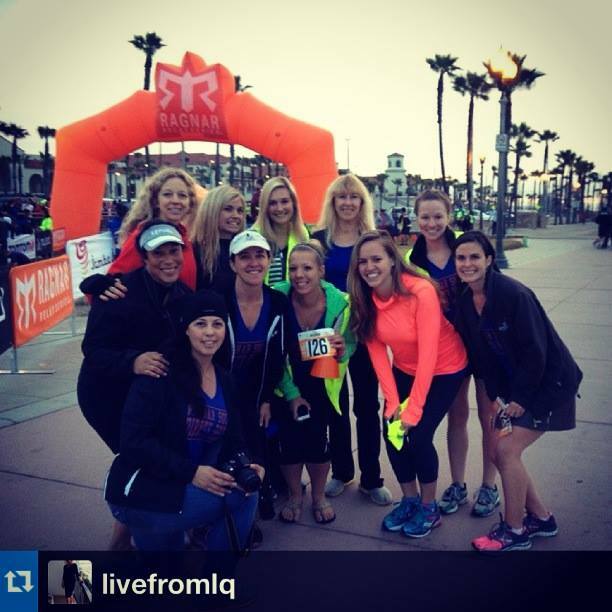 The race started in Huntington Beach, and we finished in downtown San Diego. 20 teams or so started every 15 minutes. Our start time was 6:45 a.m. on Friday, so we got to the start about an hour before hand for a safety check and registration. And of course, team photos. 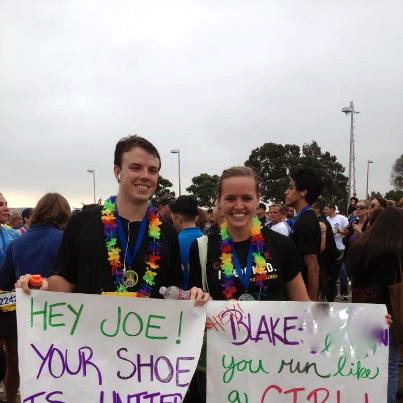 I love Huntington Beach — I had a fun 13.1 there last year, and my good friends Heather and Blake got married there as well (in HB, not at the half marathon). I’ve also spent a couple of 4th of Julys there. Fun way to start the weekend! 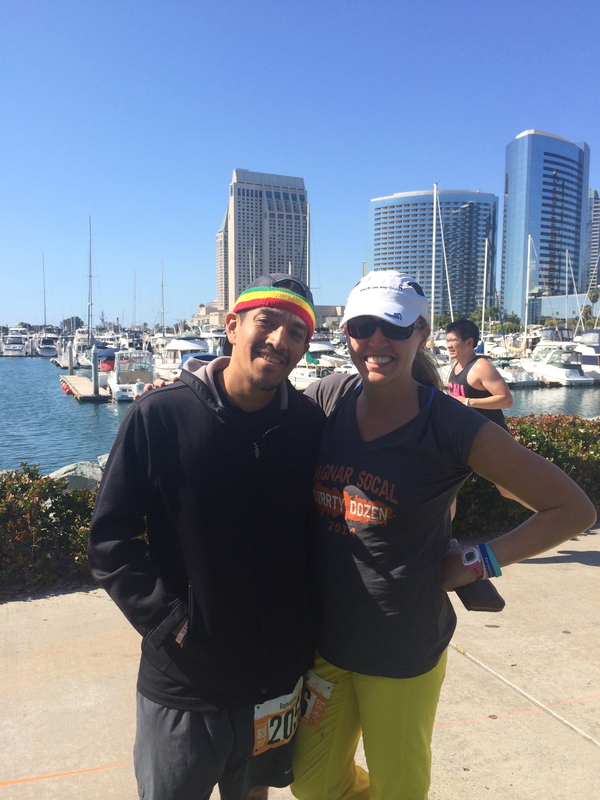 My friend Andres (from my DTLA Running Group and BoMF) was running on a different team — the awesomely named “Ragnafarians.” We bumped into them many times throughout the weekend. I was so impressed by their attention to detail with their theme. After a good amount of time goofing around, it was 6:45 and Lizzie began her first leg along the bike bath in Huntington Beach. She ran even splits and seemed relaxed. 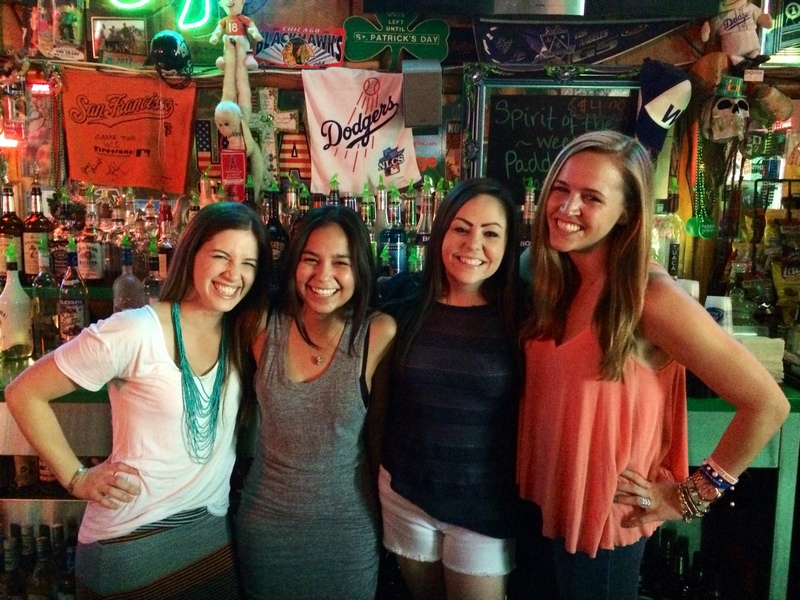 Our first legs took us from HB to Irvine — Jenica ran through Chapman University’s campus, Jillienne’s exchange was at Angels Stadium, and I picked up the slap bracelet baton from Amy in Tustin. My first leg was 9 miles through the city of Tustin to Orange County’s Great Park in Irvine. Although I’m no OC native, I know the Great Park well because I ran the Color Run there two years ago (with my friend Riley!) My first leg was hot and slightly uphill most of the way. Although it wasn’t the most scenic of routes — mostly residential with some strip malls — I had a great time. 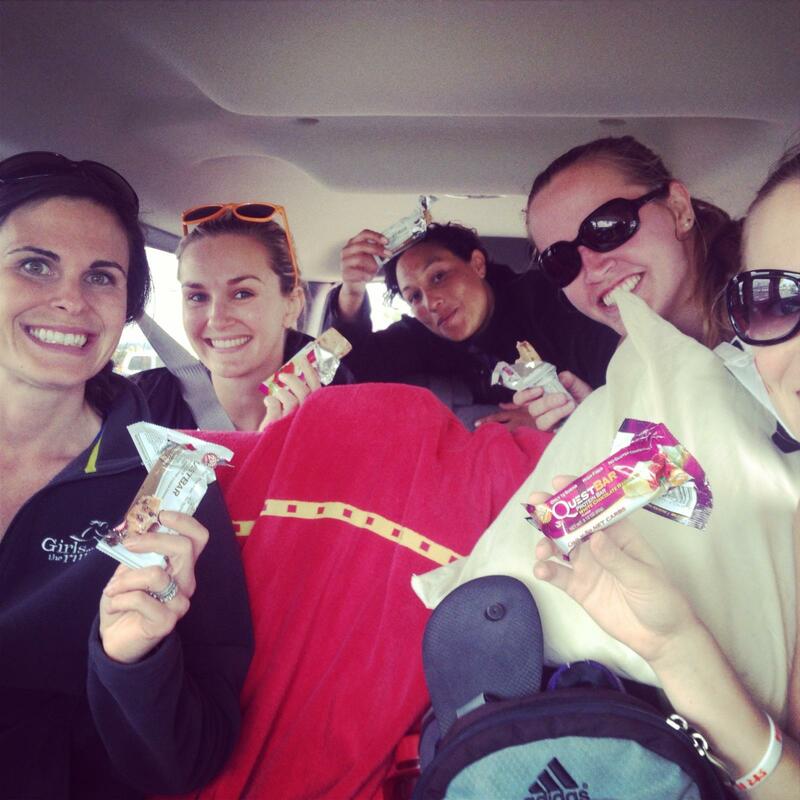 The roads are not closed for Ragnar events, meaning that we often got stopped at stop lights. 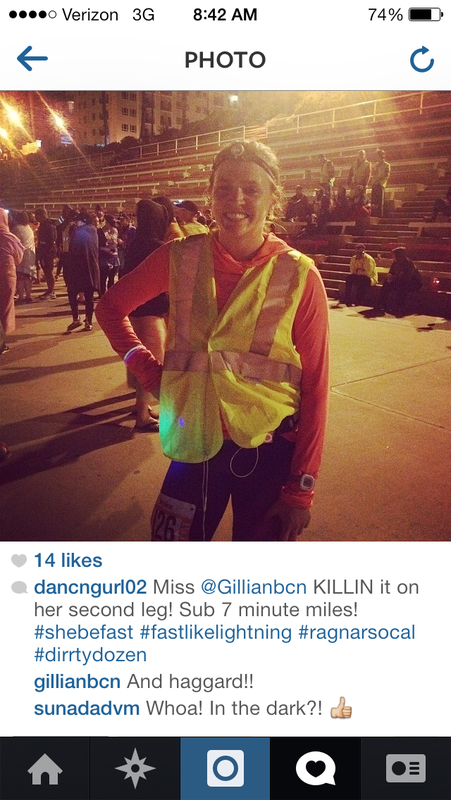 While it was sometimes annoying, I enjoyed the ability to interact and chat with other runners. I went out a little fast, but had my total pace come in at 7:22/mile. In Ragnar parlance, “kills” are the number of people you pass each leg. My first leg had a kill count of 42. Shout out to Thirty 48 for saving my feet and calves in the first two legs! I handed off the slap bracelet to the speedy and inspiring Jamie, who began the first round of runs for Van 2. 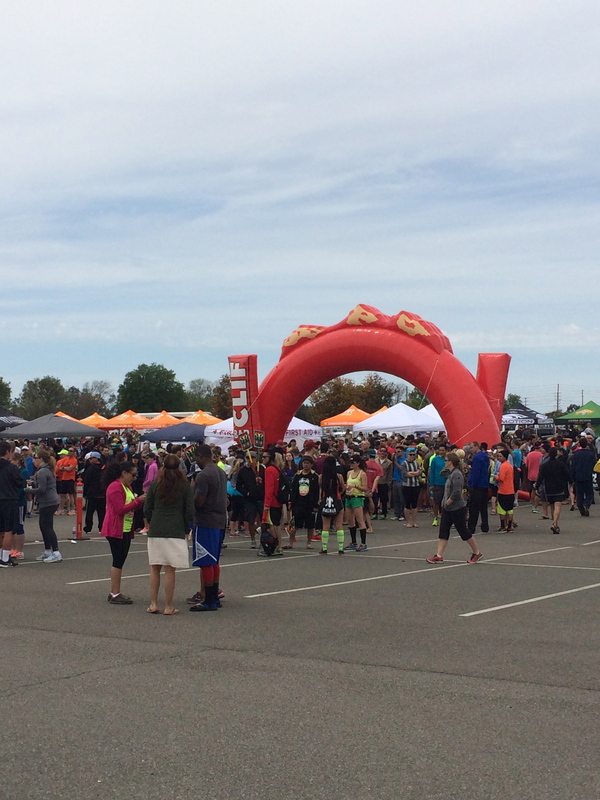 The first “major exchange” was quite a spectacle – tons of vendors and people milling around looking for their runner or runners looking for their teams. After I cleaned myself off to the best of my ability (dry shampoo and Action wipes FTW), we refueled with Quest Bars that Jillienne picked up from Nutri Shop Pasadena. SO good. 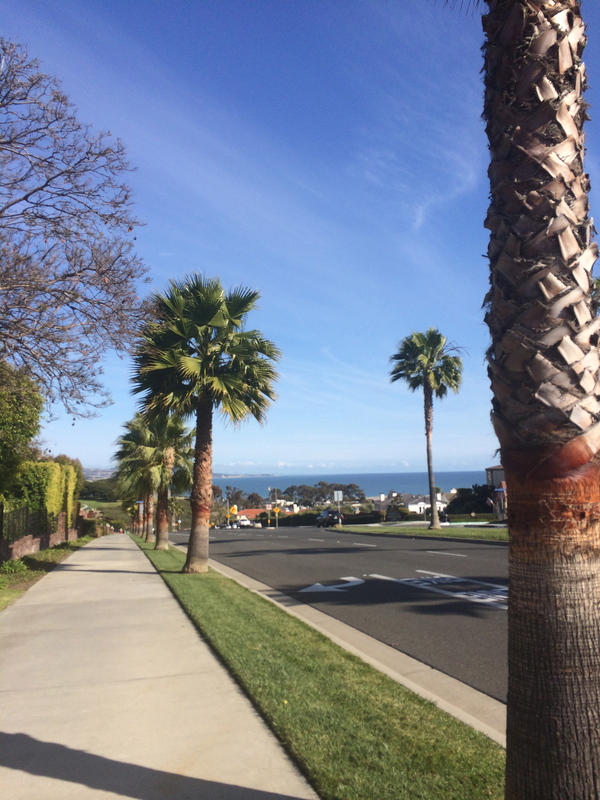 We drove out to Dana Point where we’d exchange with Van 2 again in a few hours. 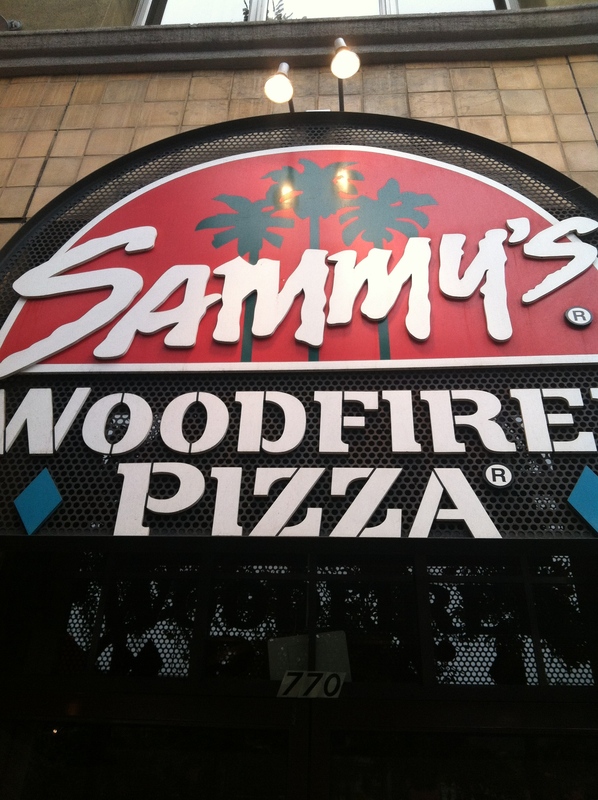 But first, we rehydrated and refueled with some pizza and beer. 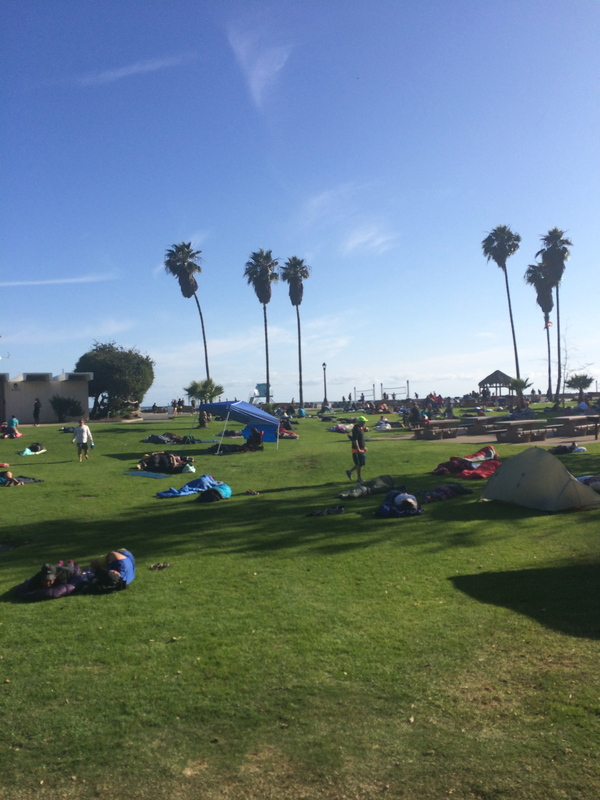 …and it was at this major exchange where I dubbed Ragnar “Coachella for Runners.” Tons of people were using this idle time between the exchanges as a chance to sleep (in sleeping backs on the grass). Others were eating, drinking coffee, foam-rolling and tiger-tailing. 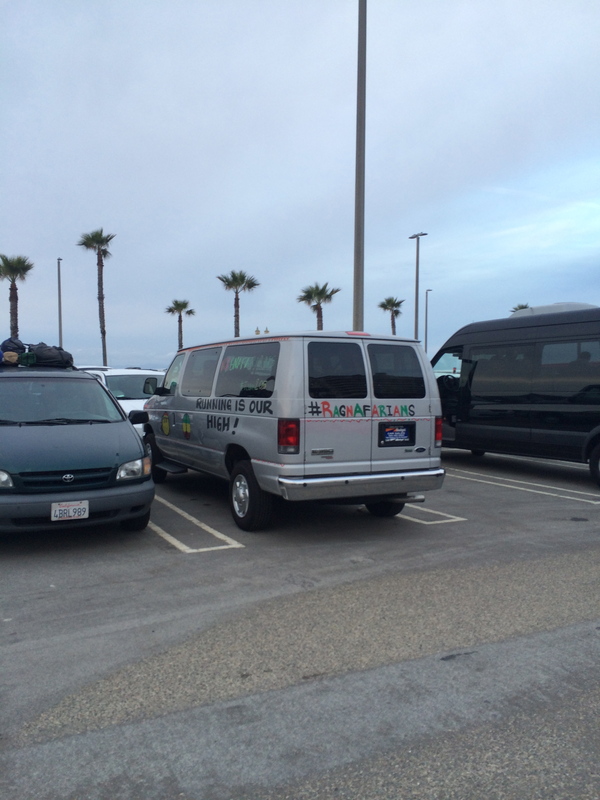 The rest were marking vans with innuendo-filled sayings, or of course, chatting about running. It was so awesome being surrounded by hundreds of people who are as obsessed with the sport as I am, and it reminded me why I love it so much. 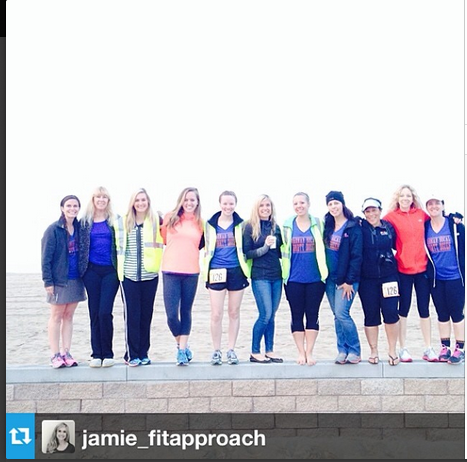 I also ran into my Back on My Feet buddies in Dana Point. I would have been on their team if Dirrty Dozen hadn’t nabbed me first, so I was glad I got to spend some time with them. After a few hours, it was time for Lizzie to start her second leg. 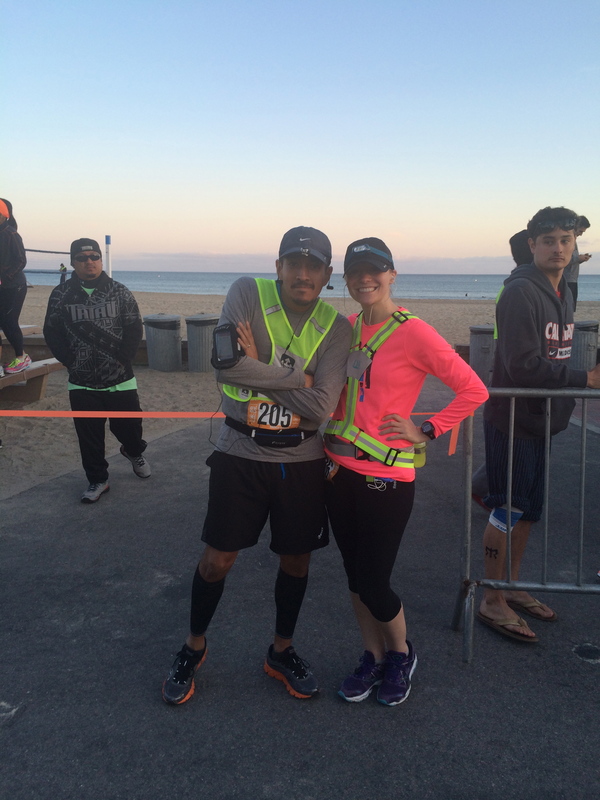 It was awesome that she and Andres (from the Ragnafarians) were waiting in the hand-off zone together! Can we just appreciate Dana Point for a hot sec? Lizzie’s leg was challenging — the sun set right as she started, and she had 12 miles to cover in the dark with no van support of any kind. 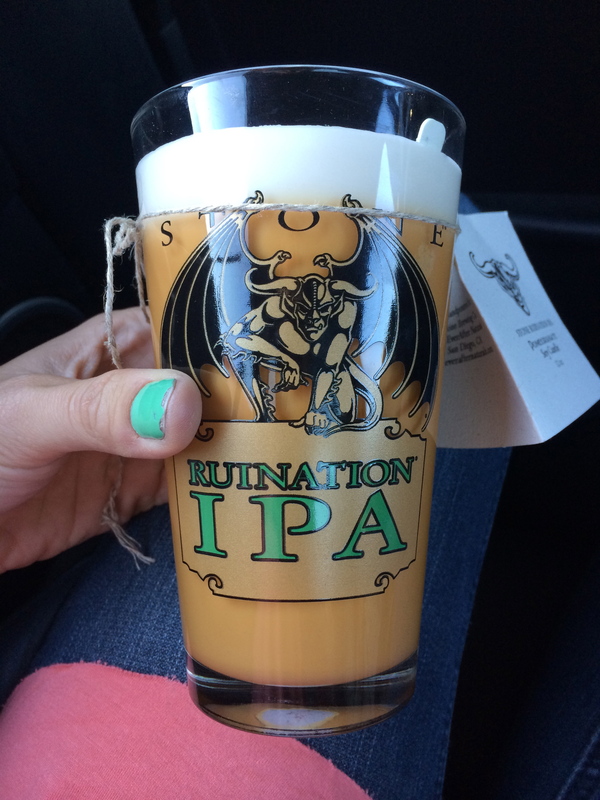 She got an awesome pint glass for finishing it though, I am still jealous. Ragnar rules require that between the hours of 6:30 pm and 6:30 am, all runners have to wear a reflective vest, a head lamp, and a tail light. 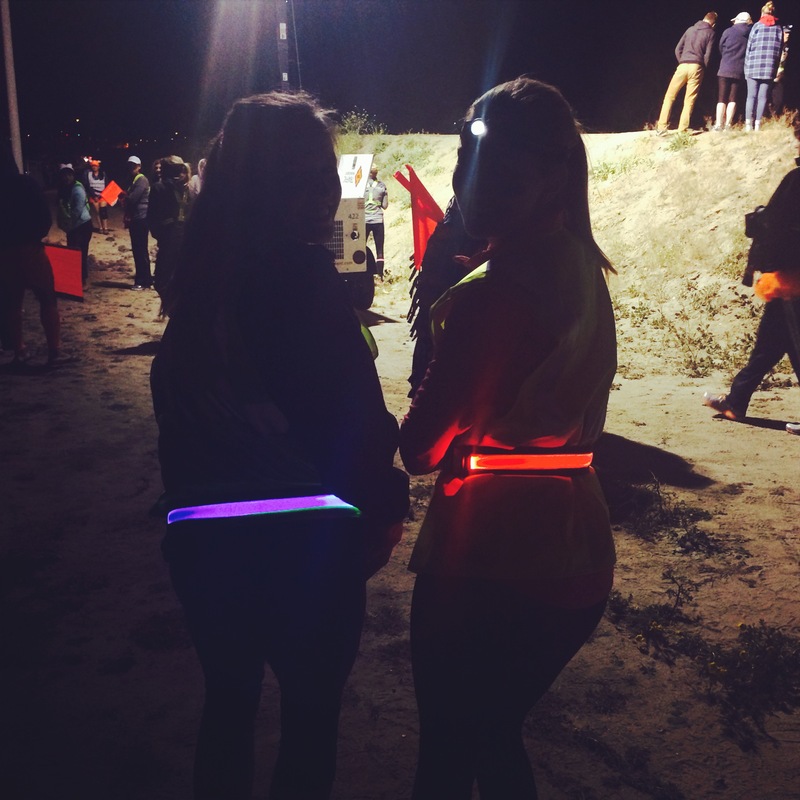 Jillienne and I sported our matching Halo Belts. Neither of us even noticed them while we were running – and they looked cool. 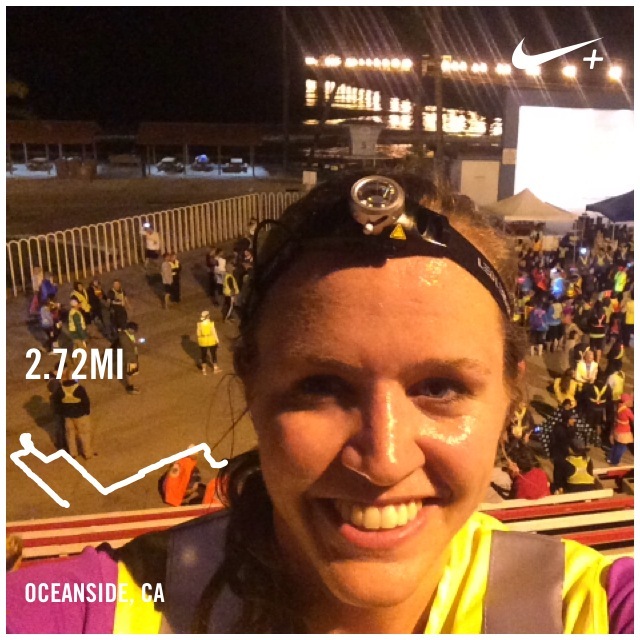 My second leg was a 2.7 miler through Oceanside down to the pier. It was short and mostly downhill, but the challenging aspect was that it was as at 1:20 am. I wanted to get it done as quickly as possible, so my van could eat and rest. My first mile was 6:30 (whoops), but I held on and finished the whole thing with an average pace of 6:47. I am SO not in 5k shape and this was a challenge — but it was so fun. I blasted my obnoxious music and was reminded of just how much I love the sport. (Yes, running is a sport). Total kills = 21. My teammates were also crazy supportive and put up with my goofiness. They also all think I’m some crazy speed demon (ha!). 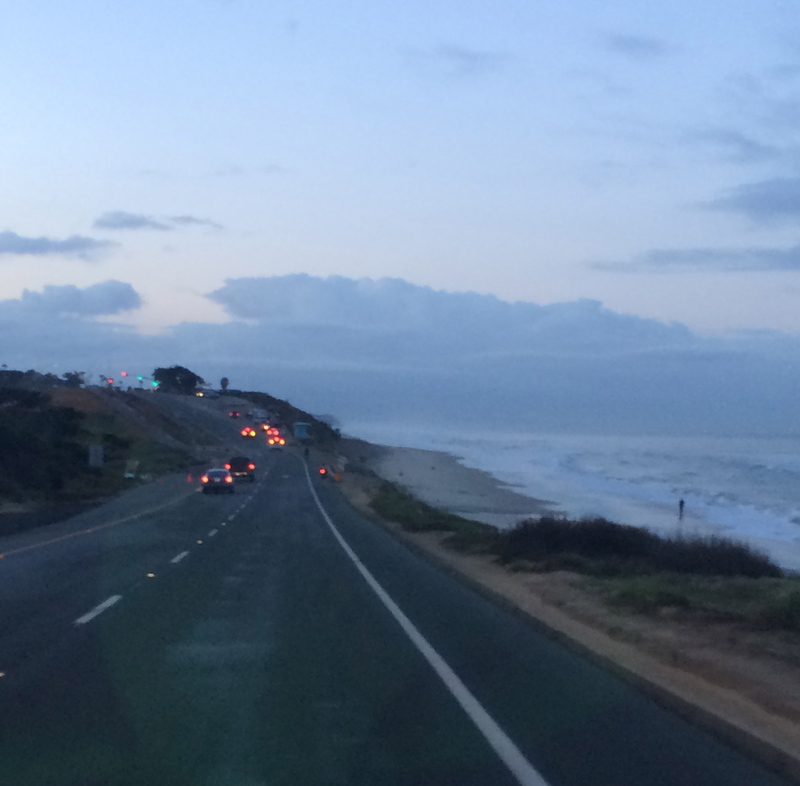 We high-tailed it out of Oceanside and headed to the next major exchange (in Carlsbad). But first, we got food at the only option — McDonald’s. We all laughed when in the woman in the drive through urged us to enjoy the rest of our day. Which day?? One double cheeseburger later and we all got to pass out for the “night.” 2 hours of sleep in a van? #winning. I LOVED all of the vans with witty sayings. Lizzie’s third leg began before 6 in Carlsbad. She had the most mileage, but arguably the sickest views. 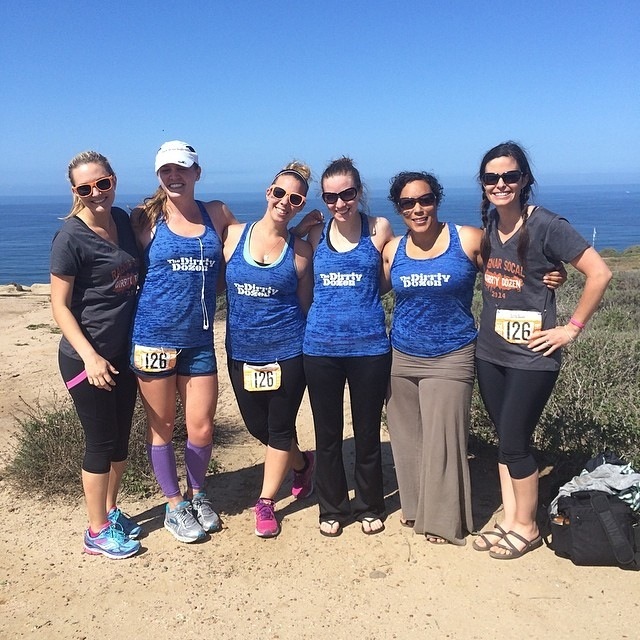 Our team killed hills and meandered through cute beach towns of Northern San Diego County. Around 10:15 am, Amy finished her last leg and “slapped” me. 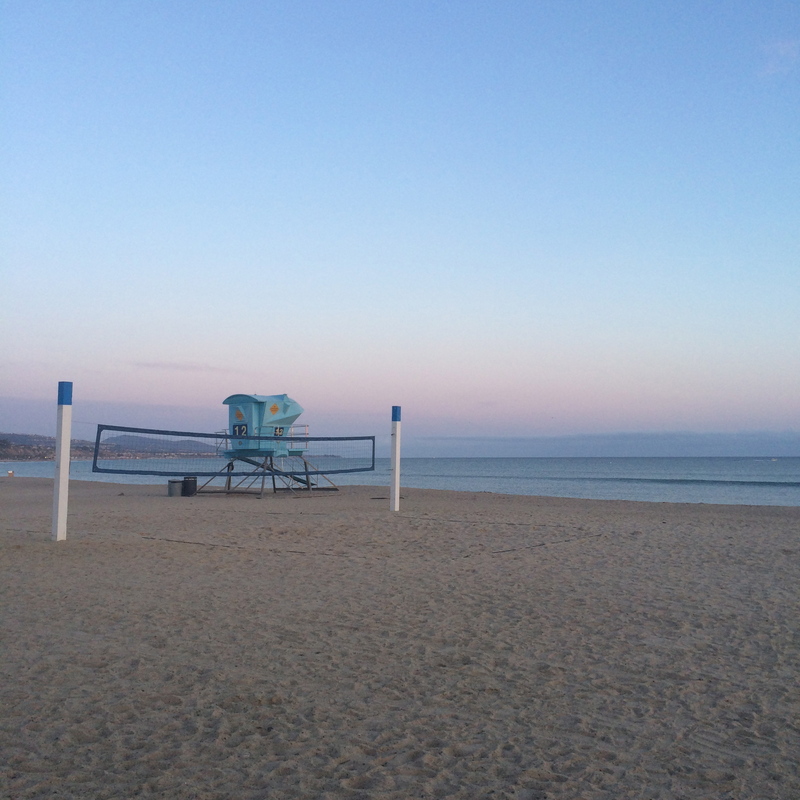 I set off for an easy and relaxed 4+ miler through Torrey Pines into La Jolla. My first time miles were pretty hilly, so I kept it controlled by enjoying the scenery and trying to perfect the art of the runner selfie. I wanted to NOT go out too fast for once, so I actually sang out loud a little bit to try and keep my pace under control. It worked! This was my favorite leg by far. It was so beautiful, the weather was gorgeous, and I wasn’t killing myself. I “killed” 17 people. My favorite part was passing a group of 3 athletic looking dudes — who I am sure though “who does this chick think she is?” One of them passed me again but only for a few strides. HAH. I slapped Jamie and she was off! My splits were uneven due to the hills — 8:08, 9:24, 7:43, 7:10 but it felt incredible. And I was done! We all snapped some photos as Van 2’s runners set off. 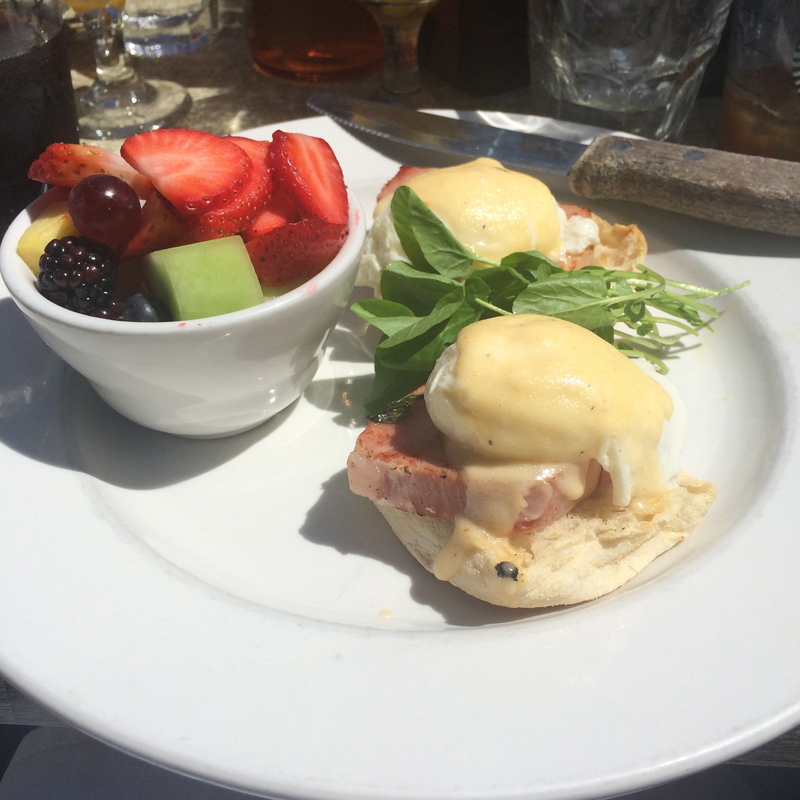 We enjoyed a nice brunch at Cody’s in La Jolla before heading down to DT SD to wait for Van 2’s runners to come in. It was SO amazing to have real food. 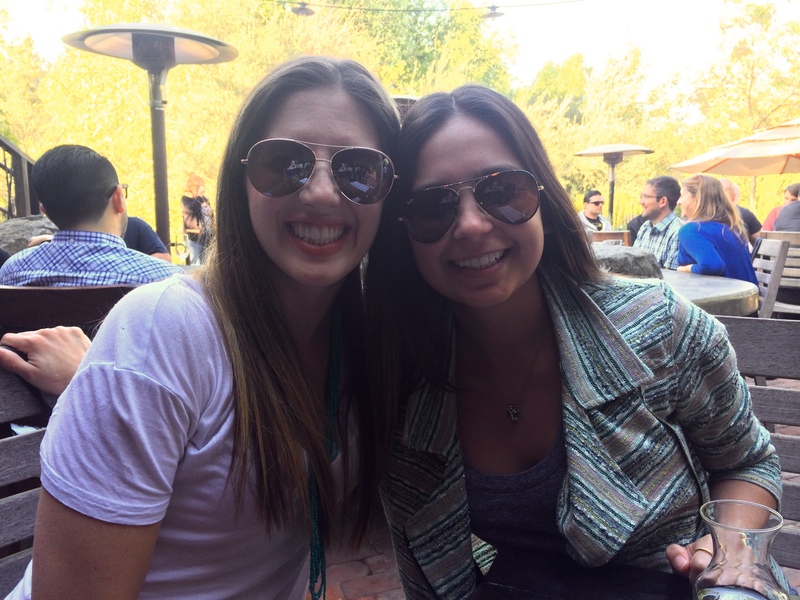 We mozeyed down to San Diego. 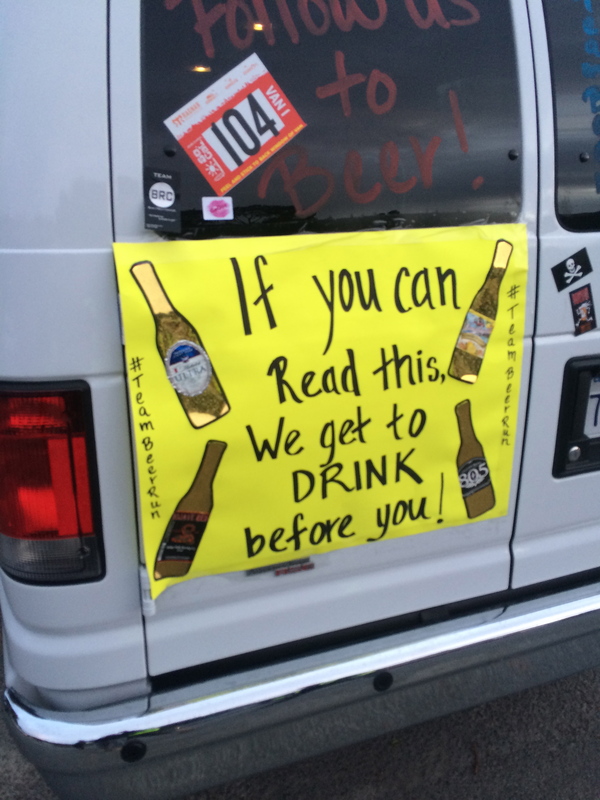 We met up with the Ragnafarians yet again (I stole a piece of pizza from them – thanks guys!) and tried to avoid falling asleep standing up. 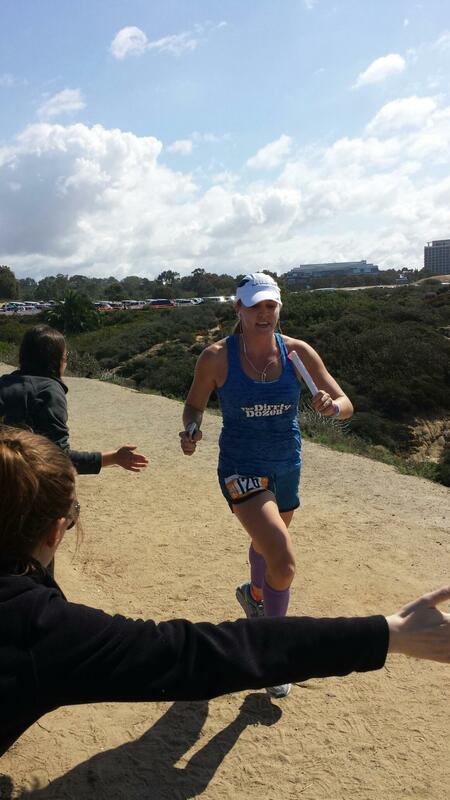 After a little while, Runner #12, Debbie, came toward the finish. 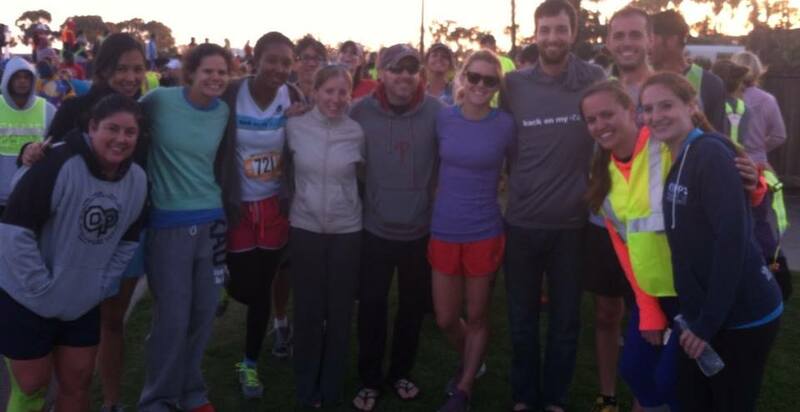 Ragnar culture dictates, though, that the whole team crosses the line together. The only problem? Debbie beat Van 2 to the finish! After maybe 20 minutes or so they appeared, and we all crossed together. (This was about 4pm on Saturday. You can do the math time wise). Any race that has a bottle opener for a medal gets two thumbs up from me. We posed for pictures, talked about the race, and then slowly said our goodbyes before going our separate ways. It was an incredible weekend and an inspiring one. 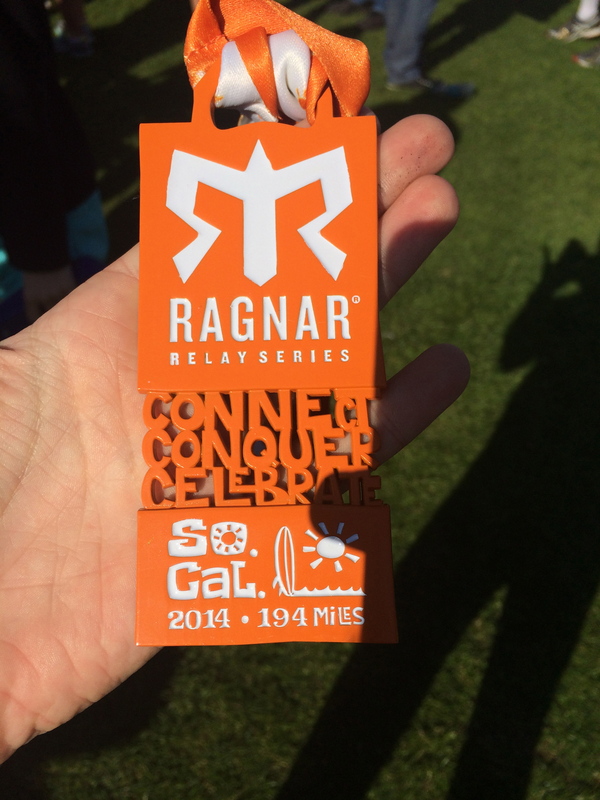 I’m not going to lie, I was skeptical about whether or not I would like Ragnar (let alone doing it with strangers!) I thought “Why would I run 16 miles over 22 hours when I could do that in a little over 2 hours?” The added challenges of no sleep, weird times, and weird nutrition made it a unique race. Additionally, it didn’t feel like running one 16 mile race — I felt like I ran 9 miles, a 5k, and then a 4 mile fun run. 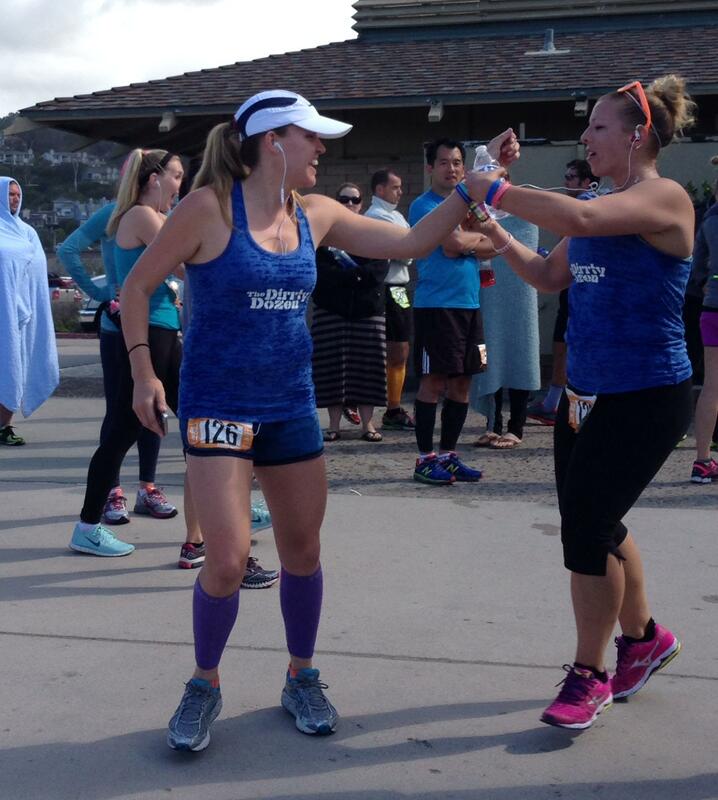 I would totally do another Ragnar and am already trying to coerce my best friend to do a team with me one day. It was crazy, but just the right amount of crazy! 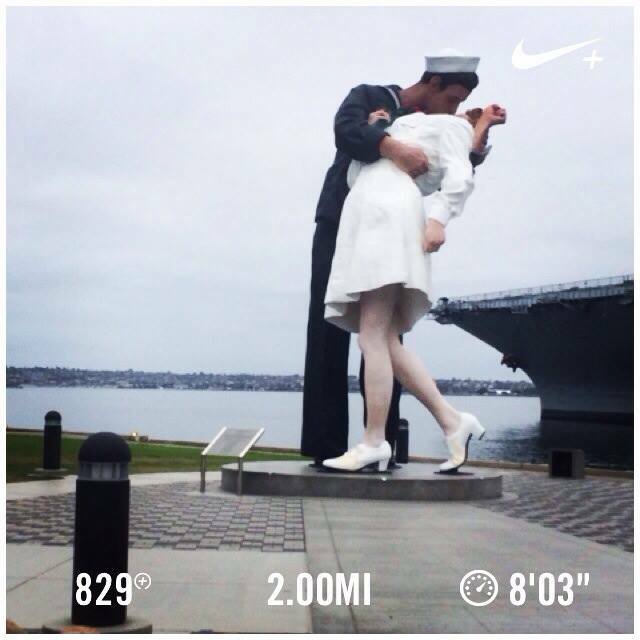 Did you log some miles this weekend? Where? So, it’s true. 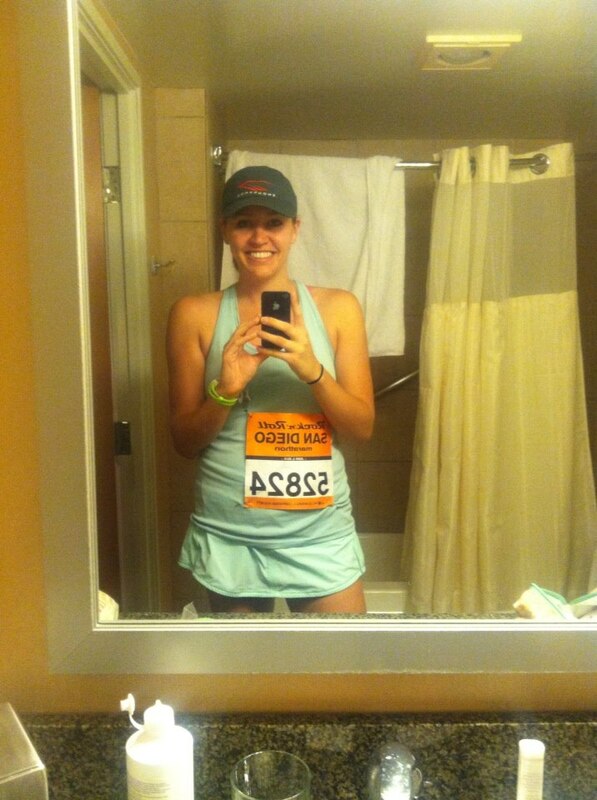 I finally put on my big girl pants and ran a full marathon! My Dad and I trekked down on Saturday to hit up the Expo at the San Diego Convention Center. We sat in some gnarly traffic, but it was nice to have the time to chat with my Dad (mostly about law and journalism, surprise surprise). We got to the expo and I picked up my bib (which was surprisingly a process – finding and then forgetting my number, filling out a waiver, etc). Of course I had to take a photo for posterity purposes. My Dad also told me I needed to buy myself an #RnRSD shirt because “you only get one first marathon.” Funny, normally parents are the ones talking you out of wasting money. But I’m glad I bought it. I also am now officially one of “those” people who drive around with a 26.2 sticker on their car. We checked out some of the booths, I took a picture for an Arrowhead campaign, and I tried to find SkinnyRunner but didn’t see her. Sad day. After the expo, my Dad and I grabbed lunch in the Gaslamp district at an Italian place whose name I can’t remember but I’d go to again. We then paid my grandparents a visit in Chula Vista, and then went back to our hotel downtown so I could chill, organize my life, and make the all-important playlist. 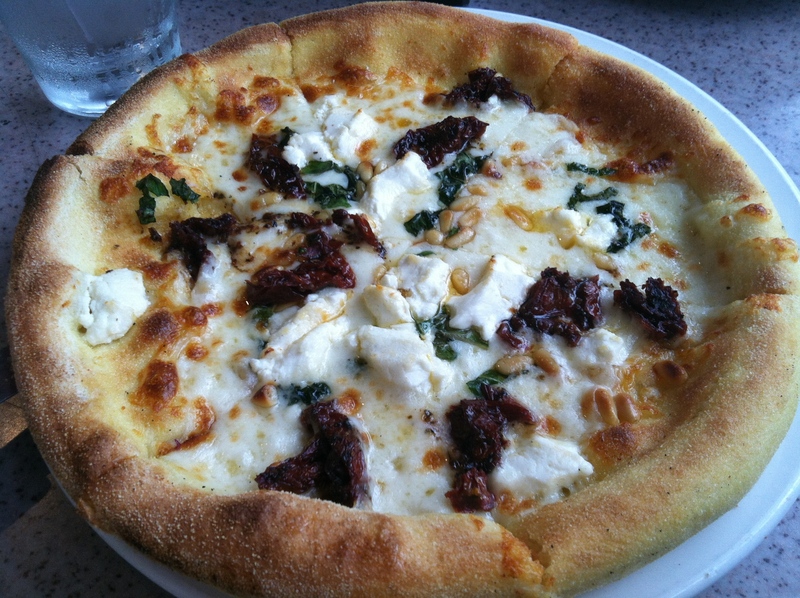 We had dinner at a great place in Little Italy called Craft & Commerce. It was super trendy but also delicious. My arugula salad also had fresh strawberries and and a strawberry and cinnamon flavored ricotta cheese. Nom. 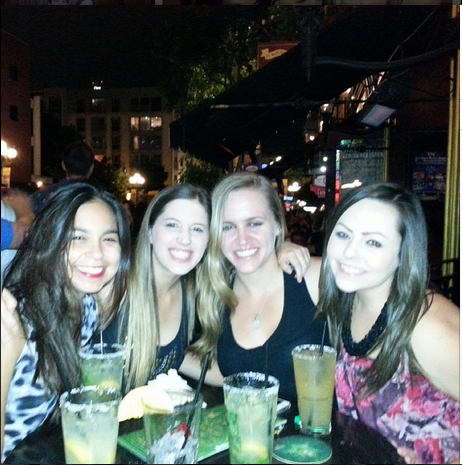 My mom had to work Saturday, but she took the train into San Diego from DTLA and met up with us late Saturday night. I called it a night early to prepare for my 4:50 alarm. But first I obviously had to wind down with whatever 48 Hours Mystery: Obsession (or whatever those shows are called). This one was about some psychotic killer. Those are the best. 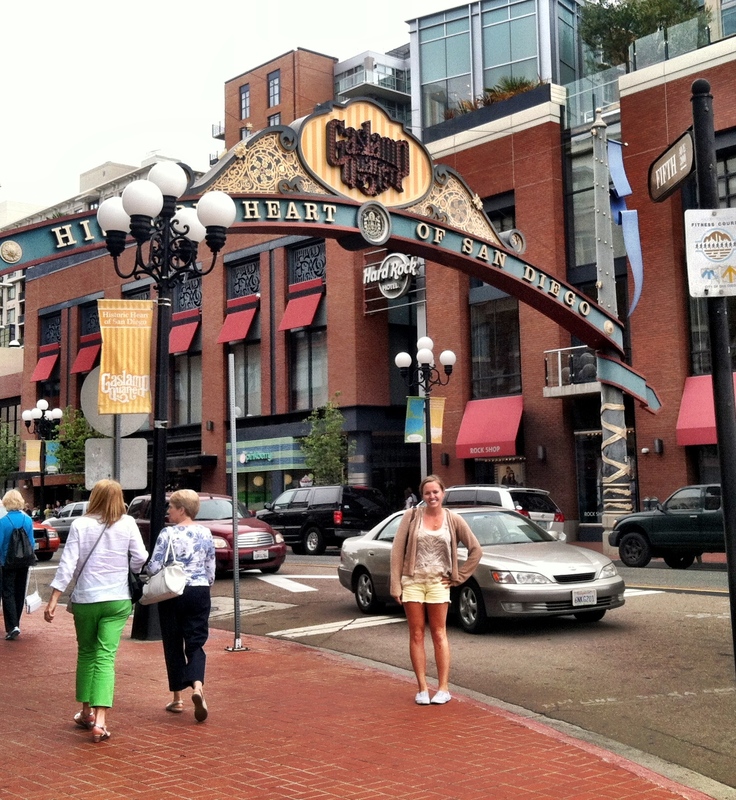 We stayed at the Doubletree downtown which was convenient (walkable to the start) but it wasn’t anything to write home about, and had terrible parking. I stuck to my mantra of nothing new on race day. I had gluten free oatmeal before my 20 miler with half a banana and a cup of coffee, so that’s what I had on race day. I also wore the same outfit, down to the hat, socks, and sports bra. My parents were willing to walk with me to the start which was great – it kept my mind off of the task I was about to do, and it was nice to chat. We said goodbye maybe 20 minutes before the start, and I headed to my corral (#2). I never claimed to be a looker. I met a really nice fellow first marathoner in the corral, Erin, and we chatted. We had similar time goals but I knew I would be stupid if I tried to actually run with anyone that early. We sang the national anthem, had a touching moment of silence for the victims of Boston, and then we were off! I had a few different goals for the race. My original “first timer” goal was to break 4:00, and I thought that would be pretty easy. My second goal was to break 3:45. My third, long-shot goal was to qualify for Boston (3:34:59). My first few miles were great – I kept telling myself to slow down, but I kept running 8 minute miles, but they felt slow, easy, and comfortable. 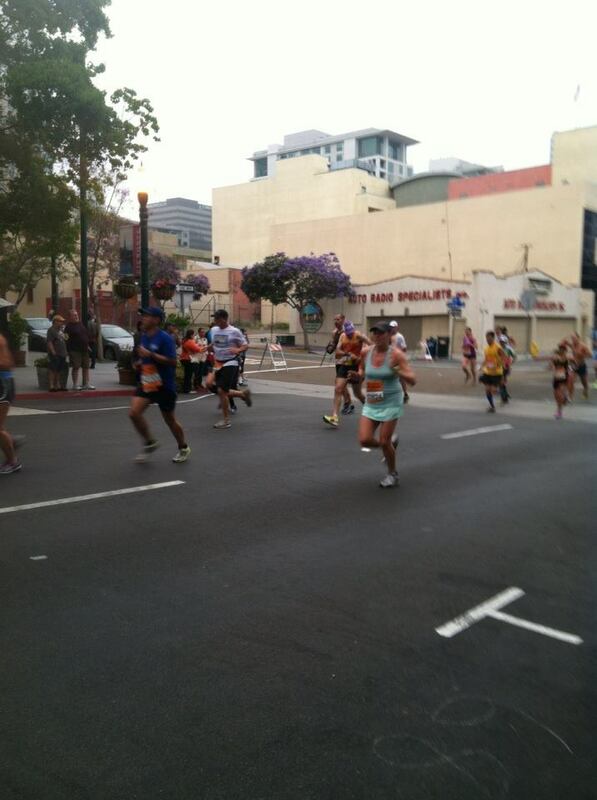 I saw my parents at mile 6, downtown near our hotel which was great. I listened to music, took in the sights, and enjoyed it. 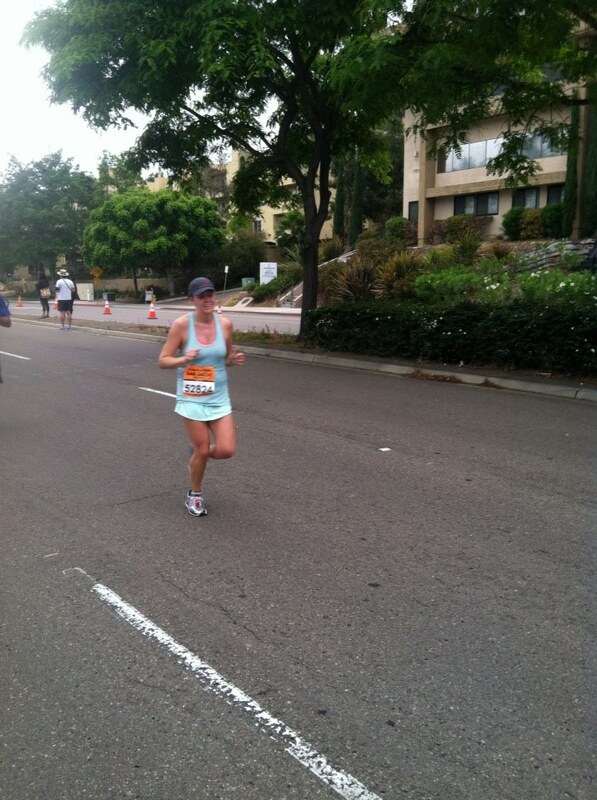 feeling great at mile 6. 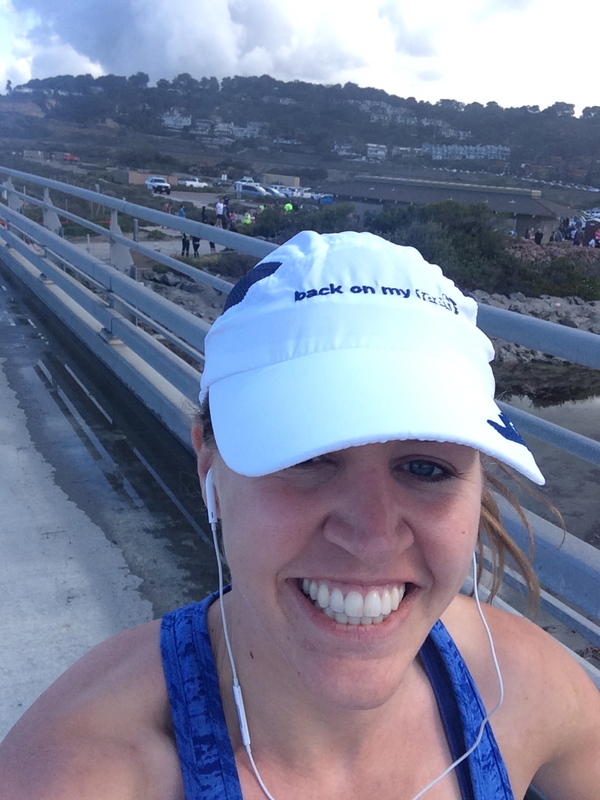 The first 10 miles were pretty scenic – we ran through downtown, Little Italy, Old Town, and over to Mission Bay. Once we got to Mission Bay, we ran for 3-4 miles along a bike path near the water which was great. I still felt great – loved my music – and hit the half at 1:44. I realize now that this was a little fast, but honestly it felt conservative at the time. I kept thinking “wow, I could run the second half in 2:00 and still beat 3:45, and there’s no way I’ll slow down THAT much.” Wrong, my friend. I broke up the run mentally into sections. The first 6 were easy – I’ll see my parents at mile 6. And then it was “get to 10 miles.” From 10, I broke up the next segment to the half, and then to 15. I thought of miles 15-18 as a unit because those were the miles I ran with my Dad when he did the LA Marathon, so I tried to envision that I had his support through those miles. Next, I broke up miles 18-22. At 22, my friend Hannes would meet me after having completed the half, and we’d run the last 4 together. 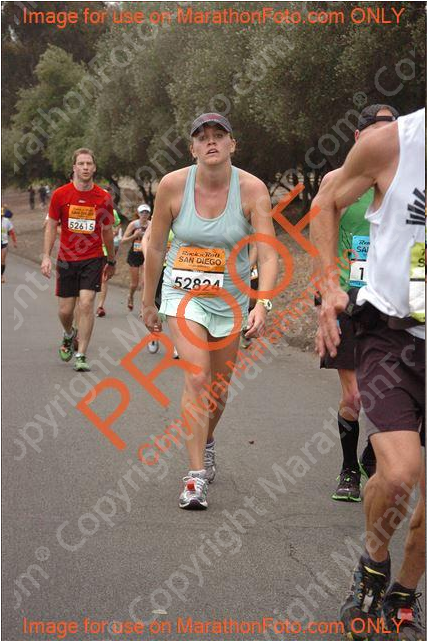 During mile 17, I started getting a little bit fatigued. The course wasn’t as exciting/pretty, and my pace slowed. I was now in the high 8s. 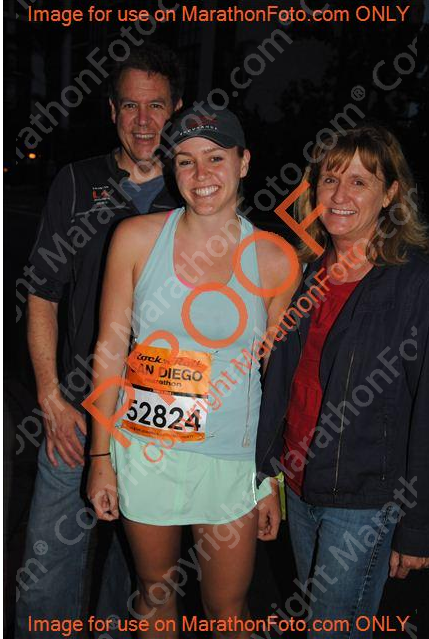 I saw my parents at mile 18 near Fashion Valley, and when they asked how I was doing, I replied “I’m Dying.” I did appreciate their “Get ‘Er Done” sign, though. I started walking through every water station and really just started to feel fatigued. Miles 18-22 were easily the most difficult. This stretch was boring – a lot of it was on the freeway, and there was a massive hill during mile 20. I walked way more than I had expected to, to the point where it was truly embarrassing. Some point in this portion of the race, I spotted Monica of Run Eat Repeat as well as SkinnyRunner. It took me a few minutes to decide that I would try and meet them, but I ran up to SR and said hi and introduced myself, and was lucky to run with her for a few minutes. She was so friendly and encouraging, and I tried to keep the “OMG YOU ARE MY ROLE MODEL” shrieks to a minimum. Due to the insanity of the hill, I wasn’t able to meet Monica, but I am pretty sure there will be a next time. At mile 22, I met up with Hannes. 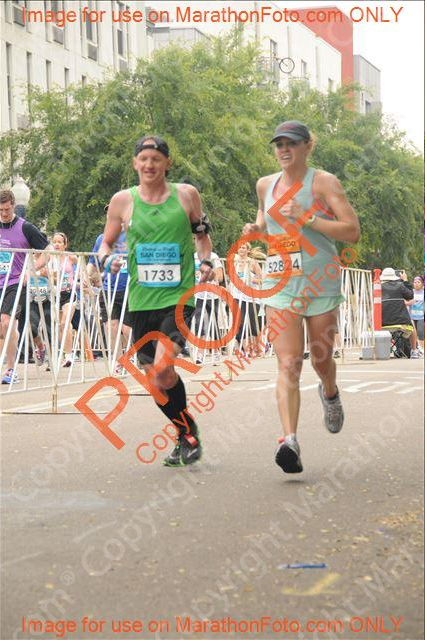 I am pretty sure he just had to take one look at me to figure out that at mile 22, at about 3 hours, there was no way a BQ was in the cards. I said “just get me to the finish.” Hannes was incredibly helpful keeping me headed in that direction – with plenty of walk breaks – but we got there inch by inch. By this time, my quads, hips, and knees were all hurting. Not like injury-pain, just SORE. Each calf experienced at least 2 charley horses. #FullOnBreakDown. 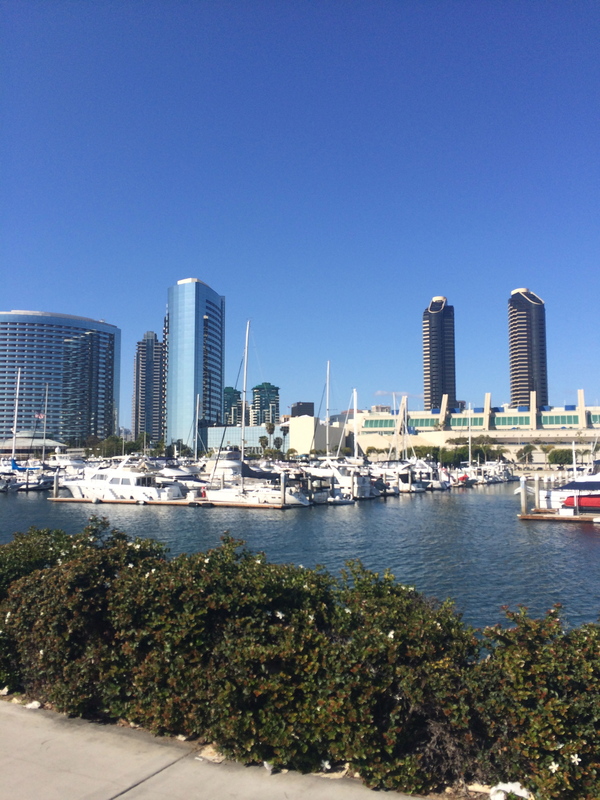 The last mile was nice – gentle downhill toward Petco Park. Hannes said “we just have one more lap around a track to go” and I flipped out. REALLY? We sped up to a 7:30 pace those last few meters. I crossed the finish line in 3:49:36. Not a BQ. Not sub-3:45. But proud of my time. I have a lot of room to improve, and tons of things to fine-tune. (I don’t suggest doing the math on the pace those last 6 miles…it ain’t pretty). I met up with my parents in the post-race expo. They literally found me lying down on the asphalt. My mom had me take a photo with a sign she made, which is oddly perfect for the blog. I felt terrible, but it was such a great feeling. 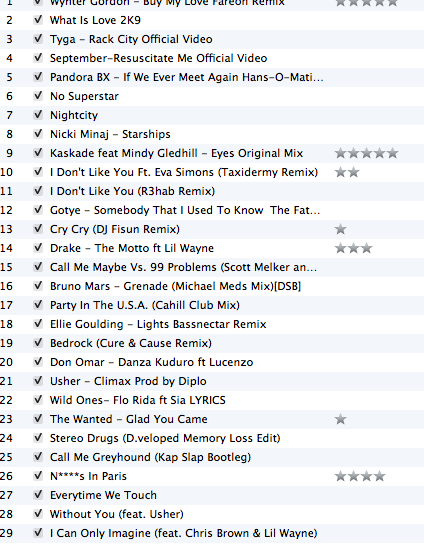 Daft Punk – Doin’ It Right (I loved this one so much I played it twice in a row). I had trouble walking the rest of the day, but otherwise I had a lot of energy. I got back to LA and my roommate was super sweet and ordered thai food for us. Whitney came over with Ben & Jerry’s, sunflowers, and kept me company while I sat in the jacuzzi and iced in the pool. It was so nice to feel the support of so many people – including tons of friends via social media. Monday was pretty rough. I was limping, and getting in and out of chairs was a pretty big struggle. By Tuesday, I felt like I had run a half marathon. Wednesday there were just vestiges of soreness, and I felt fine by Thursday. I haven’t worked out yet since (my goal is to ease back into it this weekend). I have a tendency to overdo things, so I felt like a full 5 days off was fine. My firm had a ton of events this week so I ate like a glutton, but whatever. I just can’t use the “calorie deficit” as a rationale anymore. Boo. 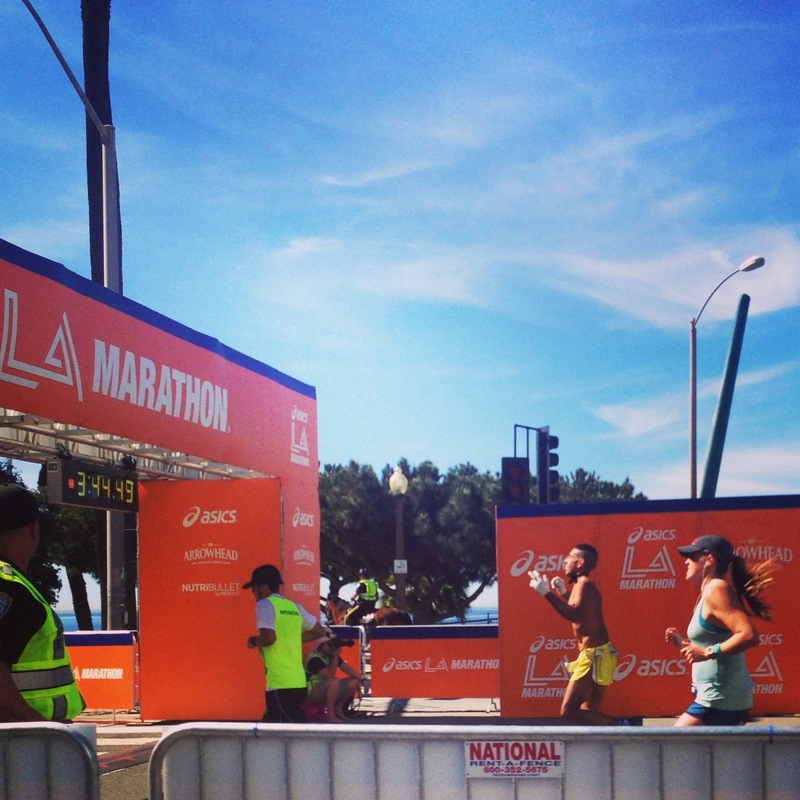 Running a marathon was not easy, but it was also awesome. During the race I told Hannes how I was thinking of maybe running Long Beach in October. I didn’t appreciate the irony at the time because I was probably walking as I said that, but marathons are so addicting. Do you have a running goal? A life goal? Get at me! 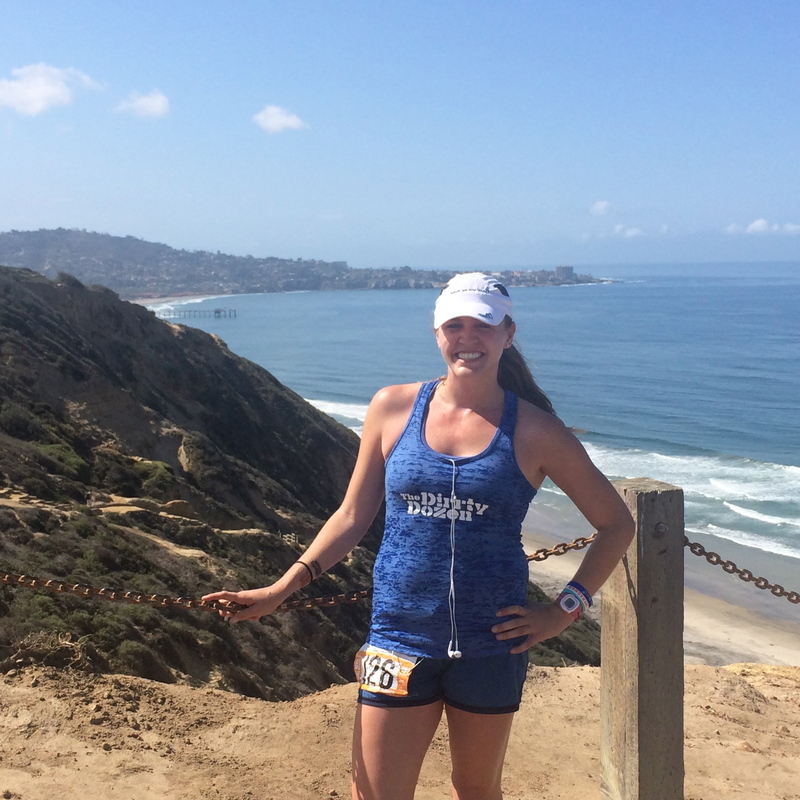 [race recap] rock ‘n’ roll san diego half-marathon. 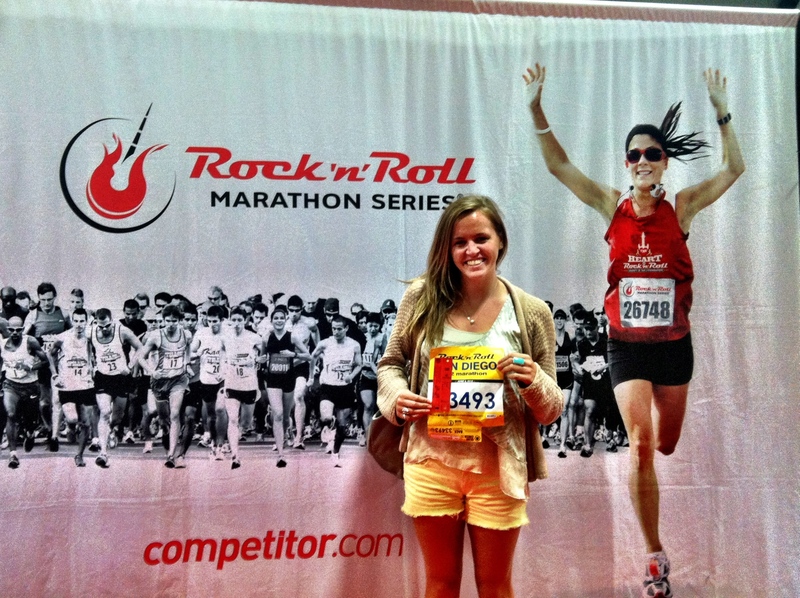 So last Sunday was the Rock n Roll Half Marathon. While I didn’t spot SR, I did smash my previous PR by about 6 minutes (from April 3, 2011 at the Madrid Half Marathon, 1:44). I set my alarm for 4:45 race morning, downed a banana and some water, along with half a peanut butter clif bar and made my way over to the start. While there was some race logistics that weren’t perfect, I got to the start on time and didn’t have any major complaints. This race is not that spectator friendly, though, so I’d definitely have a plan if you are contemplating doing this race and having people watch you. It’s a point-to-point as well, so while I normally don’t run with a cell phone I decided to this time to make meeting up with my roommate easier at the finish. Here’s a photo of me looking like I am dying. 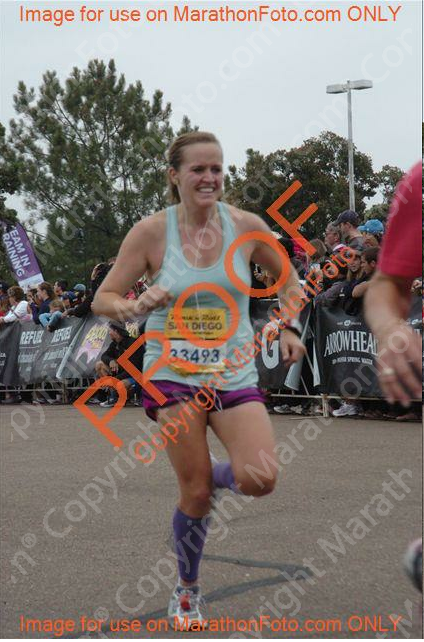 Funnily, I felt great most of the race, and had minor knee pain. Miles 10 and 11 were a little rough (boring course, side ache, and I was getting tired), but luckily I didn’t slow down TOO much. My goal going in was just to run relaxed, have fun, and to not re-injure my IT band or my knee. I wanted to keep the first 6 miles around 8 minute miles, but I was looking at my Garmin and noticed my time, and just decided to keep that pace as long as I felt relaxed. 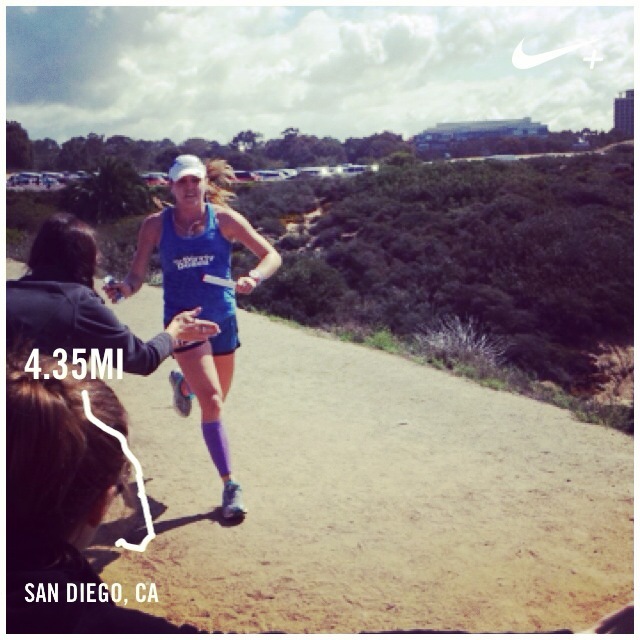 The first 3-4 miles were pretty – through downtown SD and the gorgeous Balboa Park area. 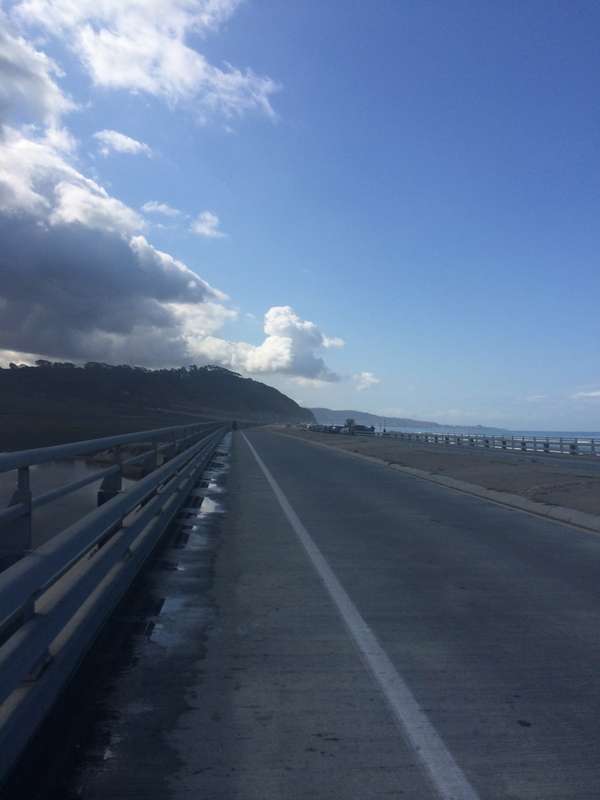 Miles 5-7 were boring – on a slanted freeway with little crowd support. Whatever. Thank god these were early miles at least. The bands on the course were unremarkable, but with any big race there were lots of spectators, people cheering, and TONS of water stations, gatorade, and even a GU stop at mile 9. 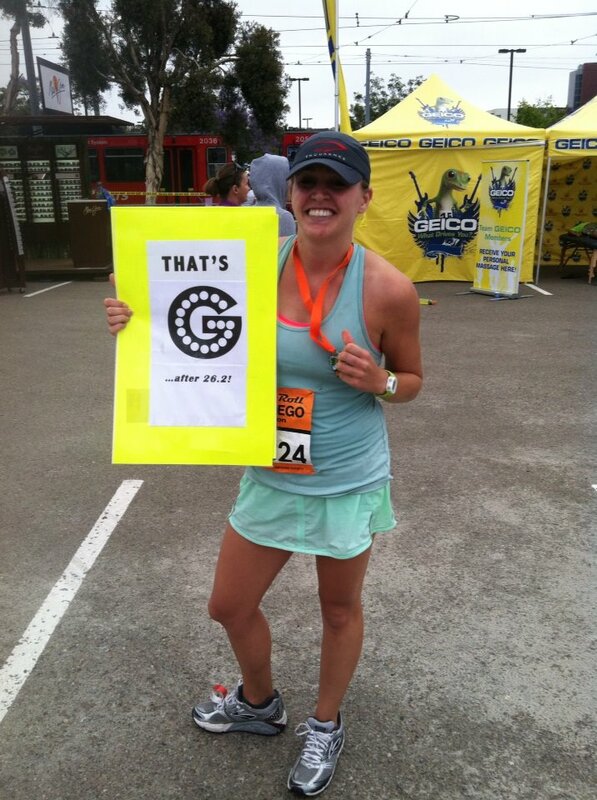 I took water at every other station, a GU at mile 9, and a little gatorade at one of the later stops. I realized I was on track to PR and was SO incredibly happy to break 1:40. Considering in January I was in pain and running 1:48, I will take it – even if the course was considerably PR friendly. 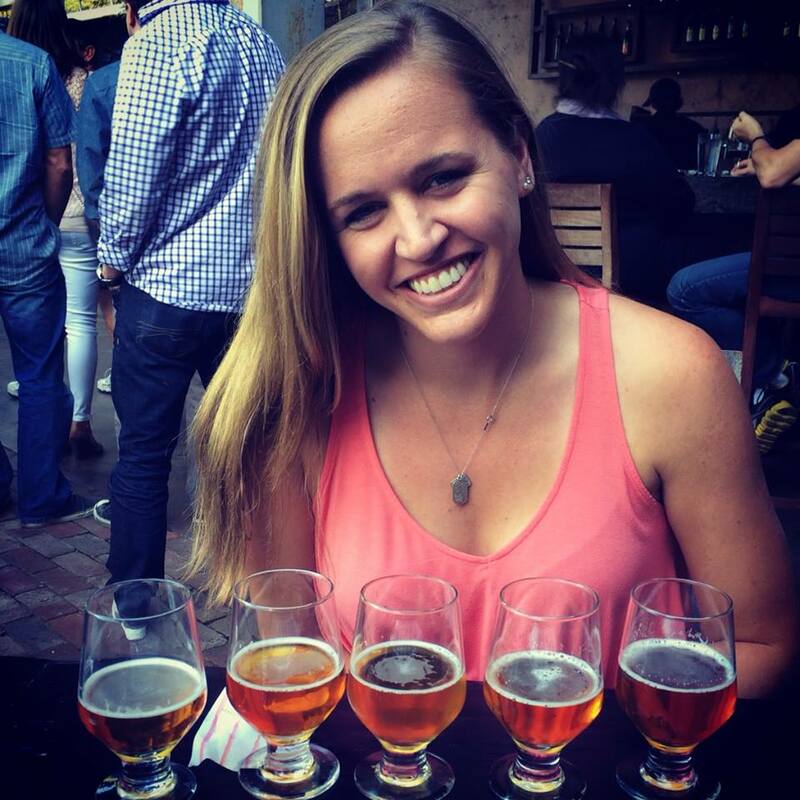 After the race, I IMMEDIATELY hit up the beer garden. Yes, it was 8 am. As I mentioned in my last post, I bought my friend Blake’s bib. My roommate, Jenn, made this hilarious sign. I didn’t see her at Mile 10 (although she was there!) but I laughed super hard when I saw these at the finish. (My apologies for the ghetto blurring job on his last name). jenn’s friend joe and me post-race. The race was a great experience. 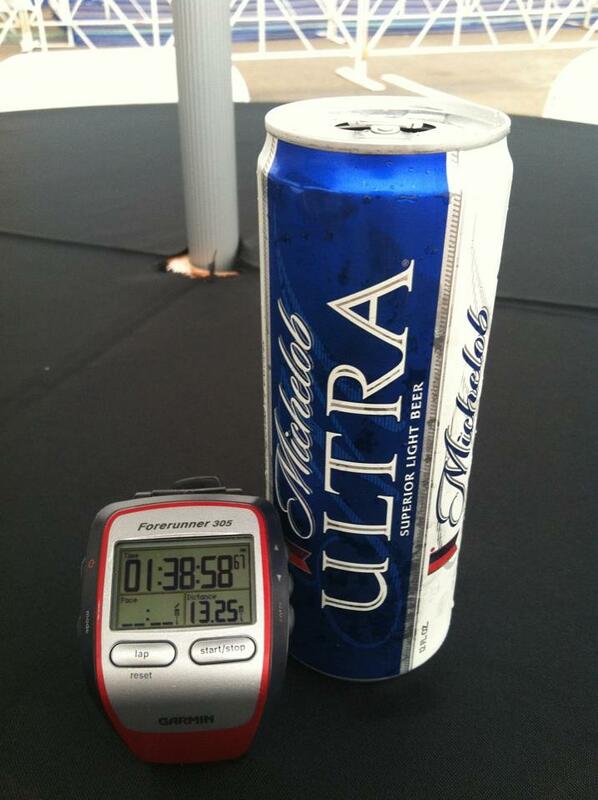 Solid time, beer, course, medal, and technical T-shirt. 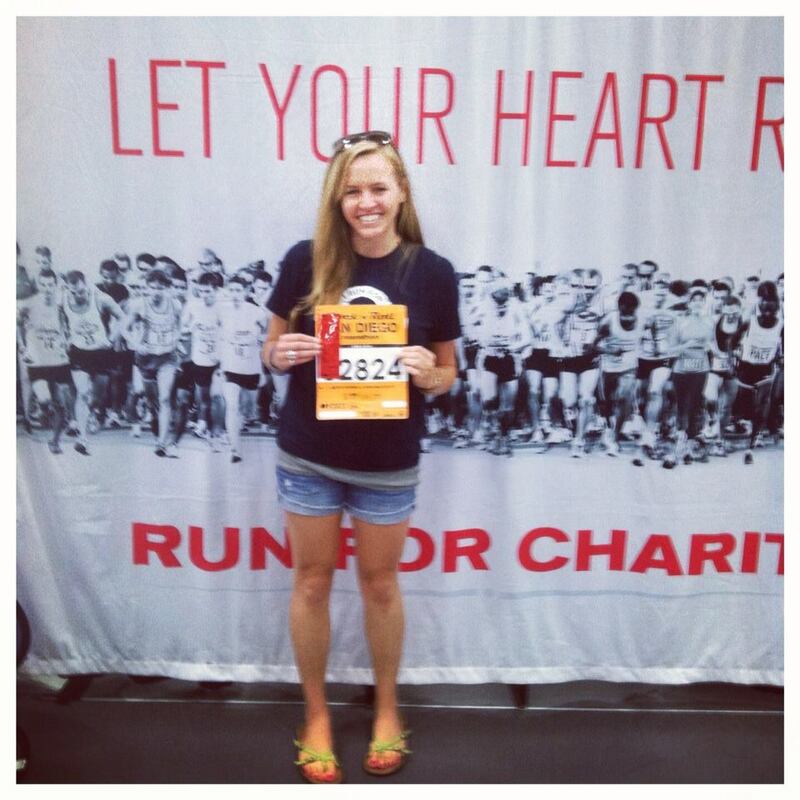 I can’t wait for my next 13.1 – and to finally get a 26.2 under my belt! 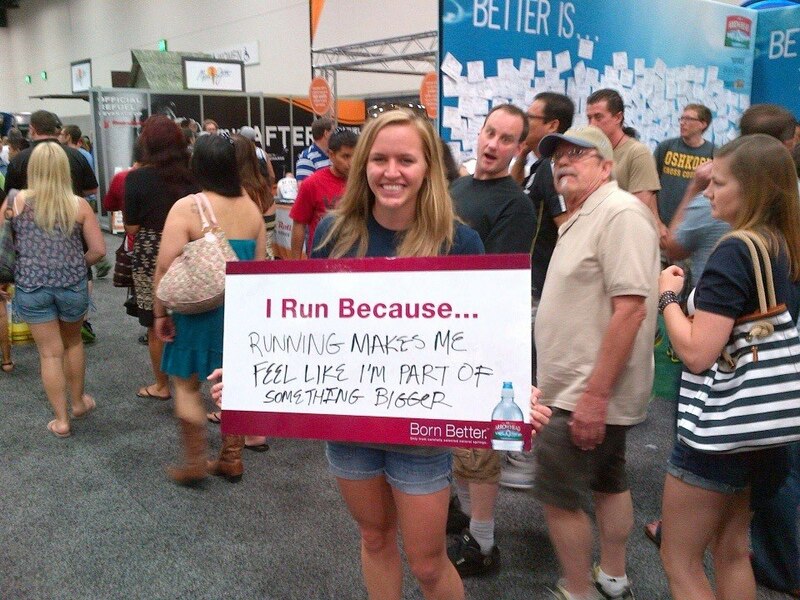 What’s your favorite half-marathon?? Where did you set your PR? 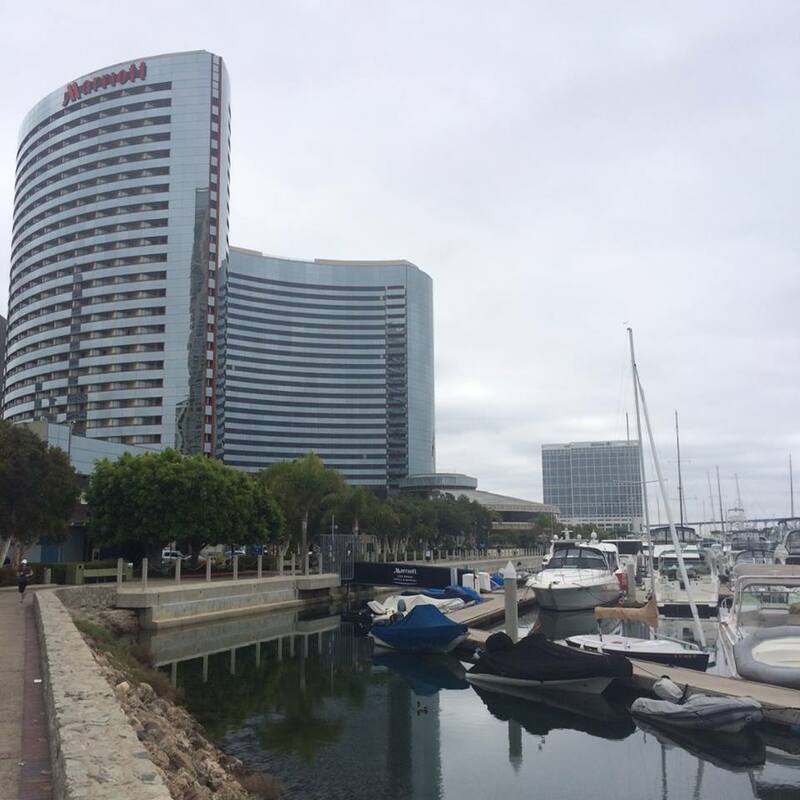 a short stint in san diego. This last week was a blend of relaxation, low-key workouts, and a short trip to San Diego for the Rock n Roll Half Marathon on Sunday. As I mentioned earlier this week, my workouts were sort of “blah.” I guess it was foreshadowing that I was ready for Sunday because (spoiler alert) I PR’d. 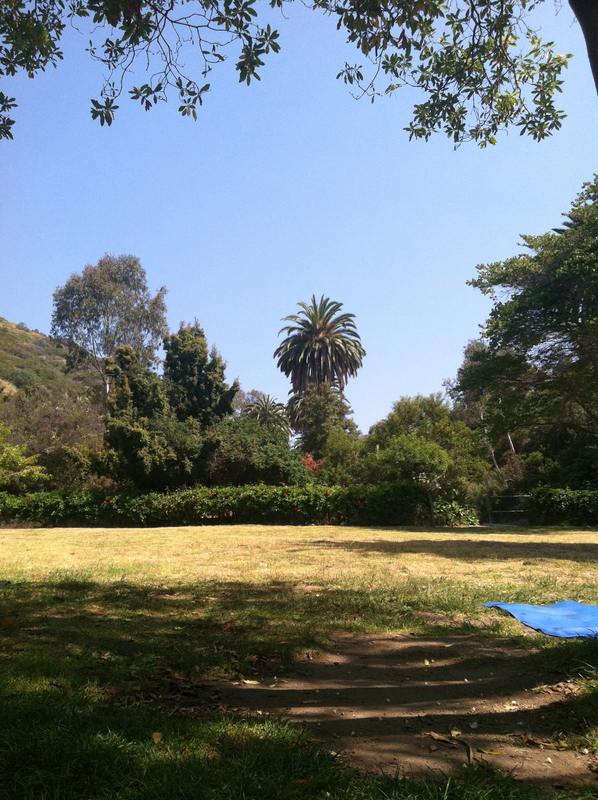 the view from my mat: yoga at Runyon Canyon. 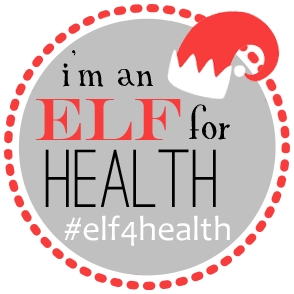 I loved this yoga class – and since it’s donation-based, I’ll try and come a lot. It was nice getting some chaturangas going in the sun! 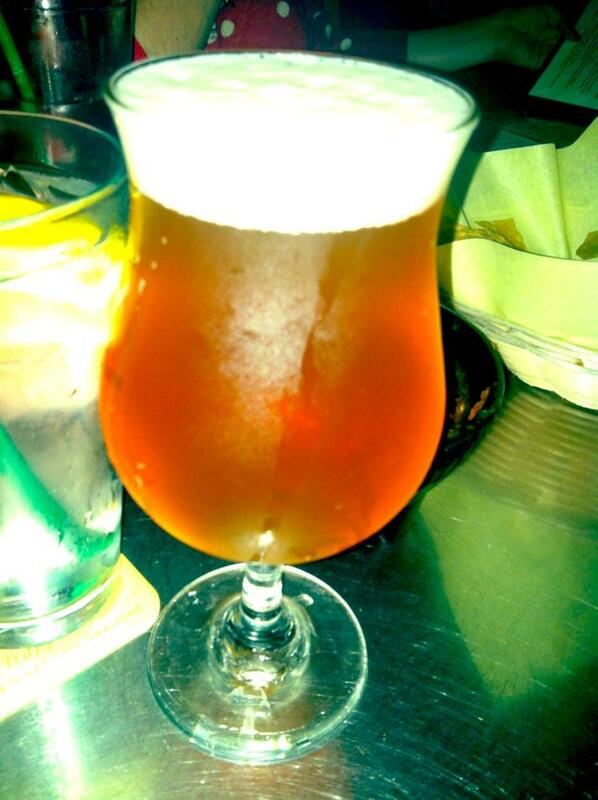 Other highlights for the week include FINALLY trying often-raved about (double) IPA, Pliny the Elder, at Library Alehouse in SM with Aviva and Armita. It. was. bomb. Friday night involved a trip back to Santa Monica for dinner at a new-t0-me place called West 4th & Jane with my usual law school crew (Aviva, Armita, Taylor, and Blake, plus Blake’s fiancee, Heather!). 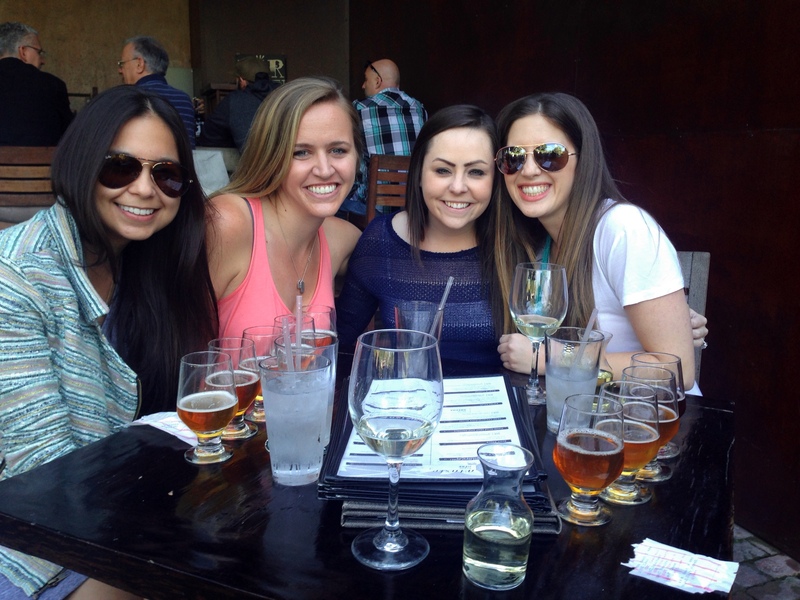 I was bummed at first because the restaurant claimed they had Estrella beer on tap, but they didn’t when we got there. 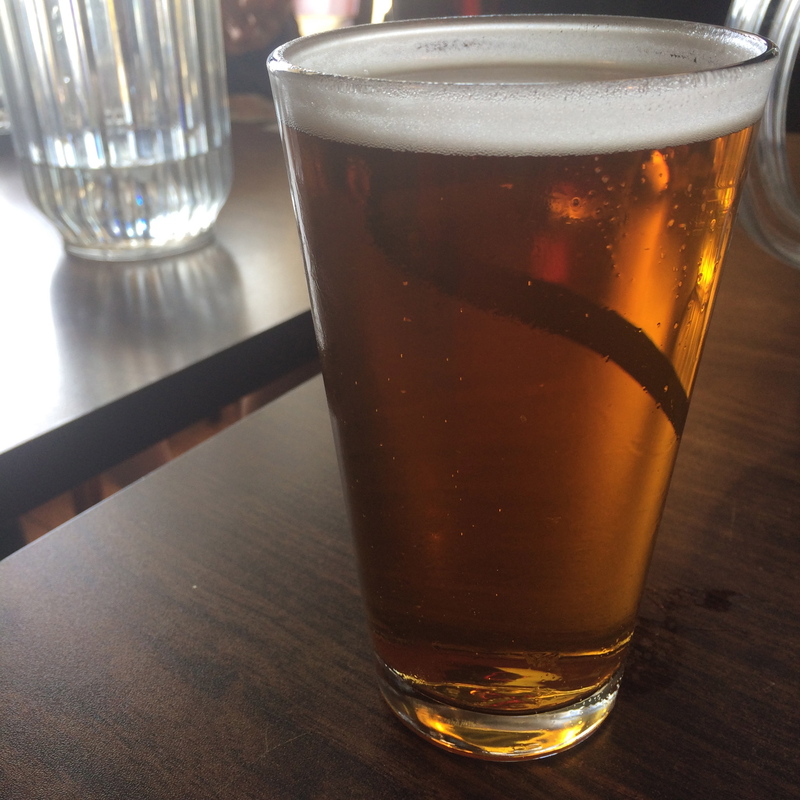 I lived and got an IPA, and then tasted one of Armita’s beers from her sampler and knew instantly what my second beer would be. 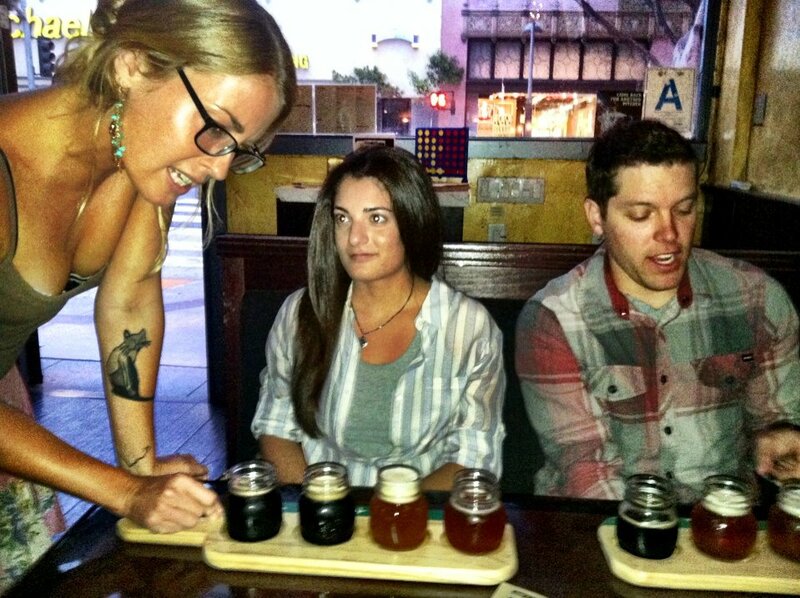 beer 101 for armita and blake. Friday morning I got up early to log a couple miles before I high-tailed it to SD. 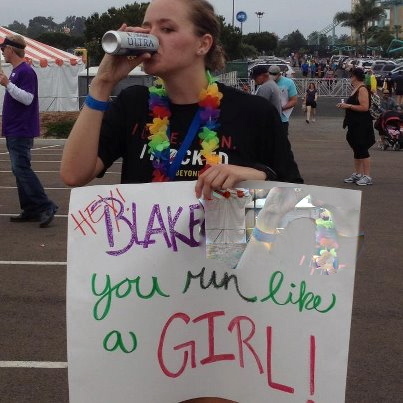 I decided to run the RnRSD Half relatively recently when my buddy Blake had to bow out due to a knee injury. I did something that is frowned upon by the race group – and bought his bib – but I probably wouldn’t have done it anyway and I couldn’t let a perfectly good bib go to waste. I booked a local Motel 6 and Jenn agreed to go down to San Diego with me. Since it was a last-minute decision and a super early wake-up call, I knew this would be easier than trying to arrange to stay with anyone. We left around 10 am Friday and got to San Diego around 12:30. 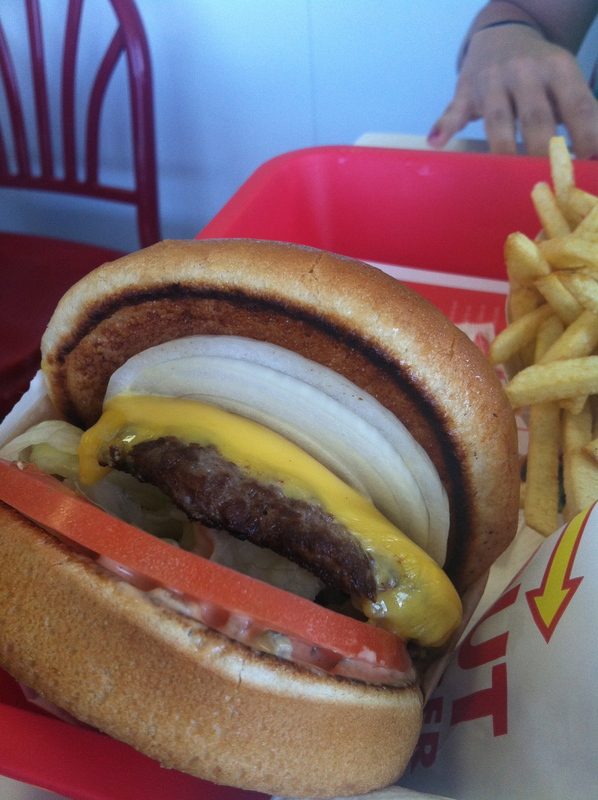 Even managed a pre-check in In-N-Out trip. Advice for Motel 6 guests: bring your own shampoo and conditioner and arrange to have someone bring you a hot cup of coffee at the race. Oh, and be charming to the check-in guy and he’ll give you a 10% discount. 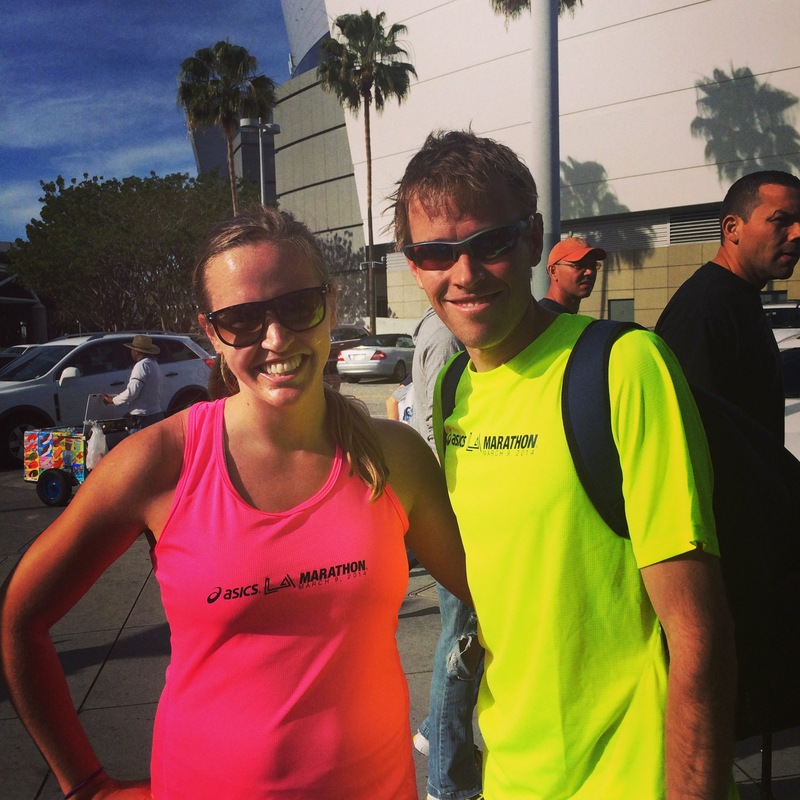 We headed over to the expo where I met up with Blake and Heather to grab “my” bib. 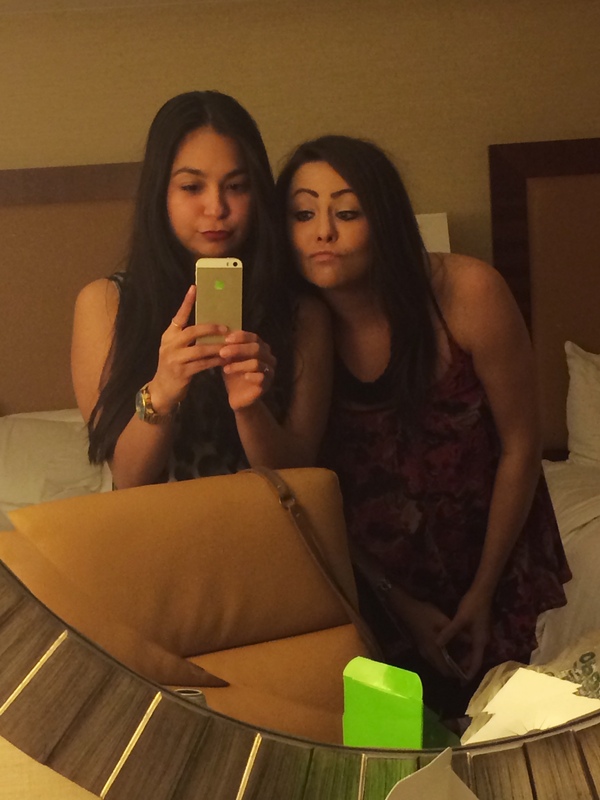 We explored the expo and nabbed some free samples. I heard Deena Kastor was there but didn’t see her. Jenn and I said bye to Blake and Heather and then explored Downtown San Diego for a bit. 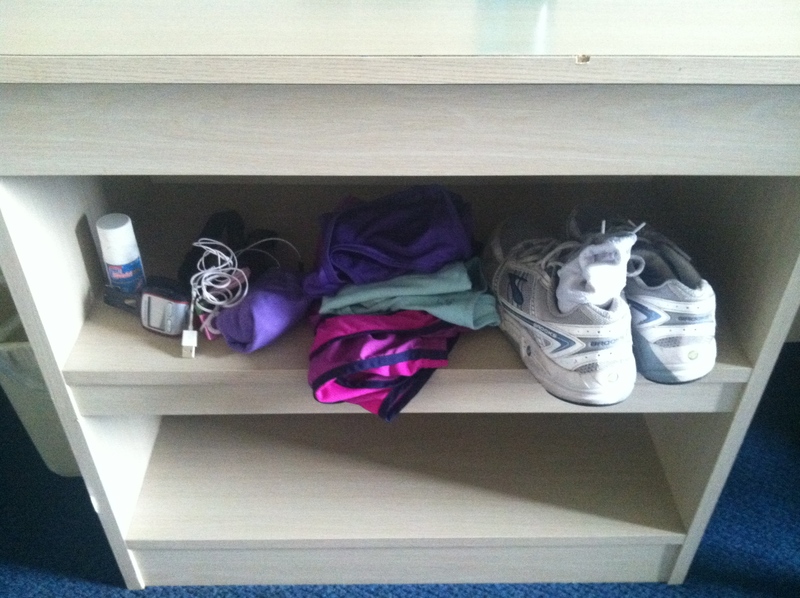 I kept my eyes peeled for SkinnyRunner but didn’t see her. Sad. We eventually met up with Jenn’s friends, Joe and Kate, for dinner. I obviously carbo-loaded. We headed back to the hotel early after arranging to carpool to the start tomorrow with Kate and Joe since Joe was also running, and hit the hay early, but obviously not before I went into OCD mode and laid everything out, including my now “lucky” PR shirt. Other things I decided were lucky: this was half-marathon #7. Boom. Oh, and I started my judicial externship today for a judge in the criminal courts building downtown. It’s gonna be super interesting, that’s for sure!